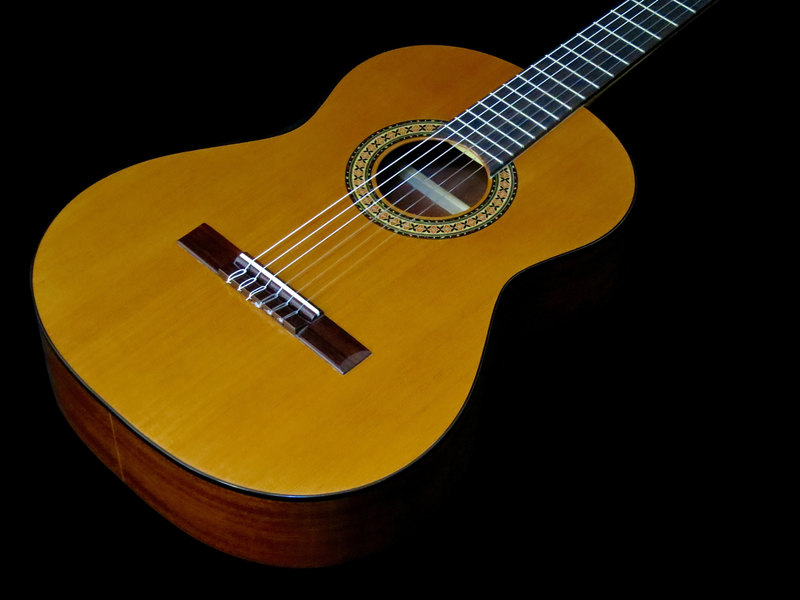 The classical (aka nylon-string or Spanish guitar) is still a very popular instrument. 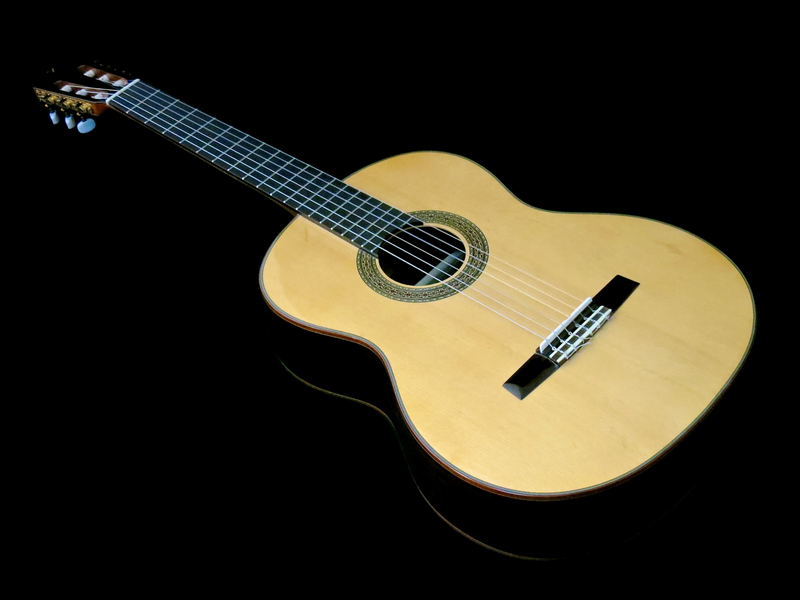 Many guitarists start their musical journey on an affordable classical guitar. 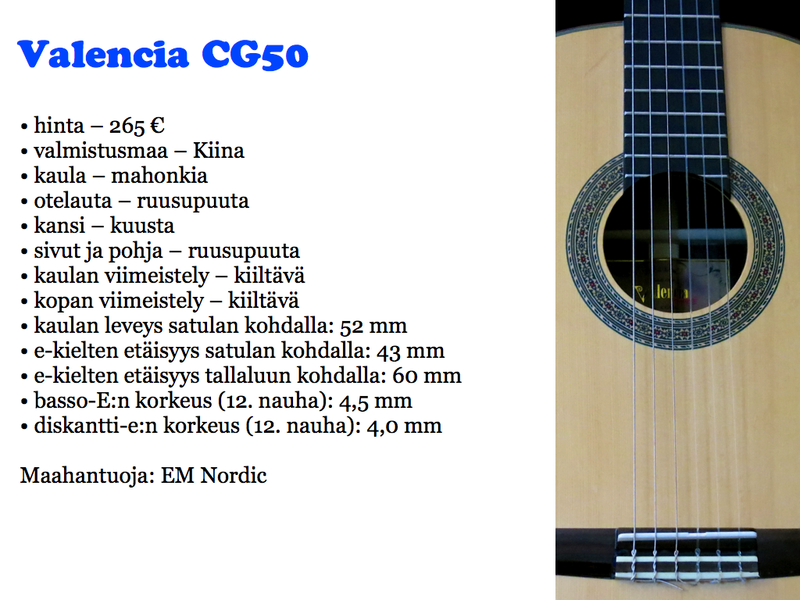 This is why Kitarablogi.com decided to do a little round-up of a cross section of nylon-string acoustic in the all-important price segment of 250-400 euros. These days you can get a decent instrument with a solid wood top for a moderate outlay. 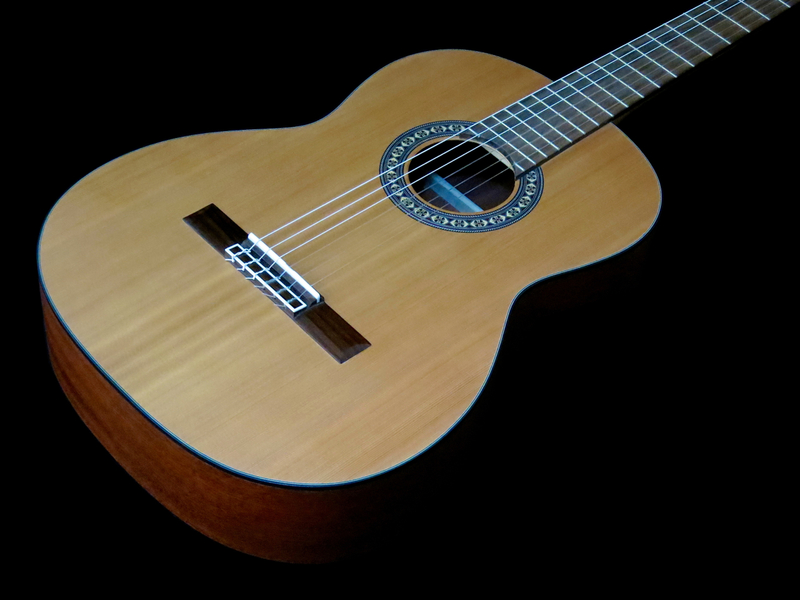 A solid top is an important ingredient in an acoustic guitar, played regularly the top will ”come to life” and mature to its full tonal potential. It’s true, you can make music on a plywood-topped acoustic, too, but such a guitar’s tone and volume will always stay somewhat restricted. 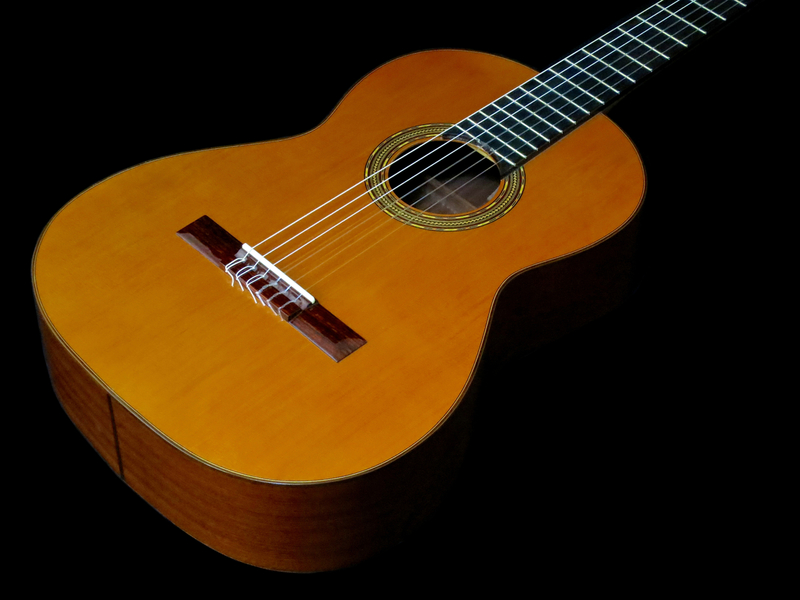 The father of the classical guitar was Spanish cabinet maker and luthier Antonio de Torres Jurado (1817-1892). 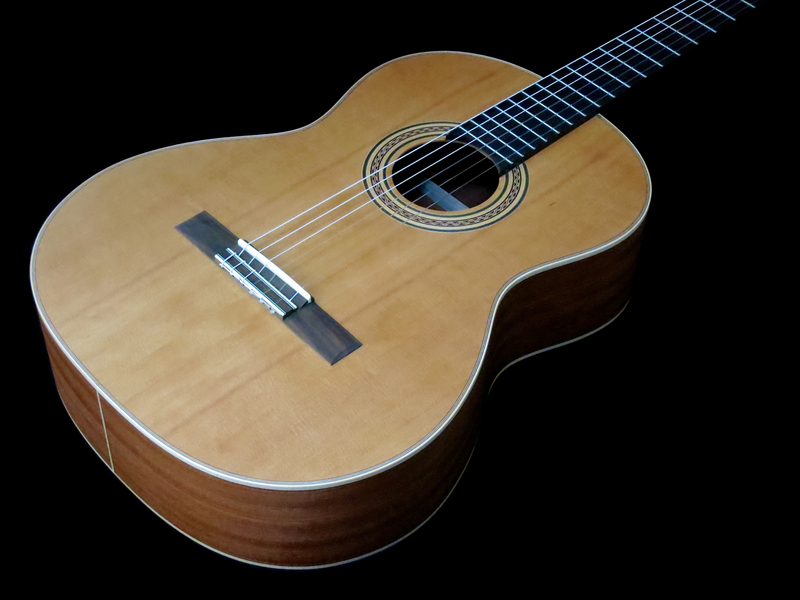 Torres came up with the final shape of the Spanish guitar, the basic construction principles (like the top bracing pattern or the separate bridge saddle), and his choices of materials still inform and influence builders to this day. 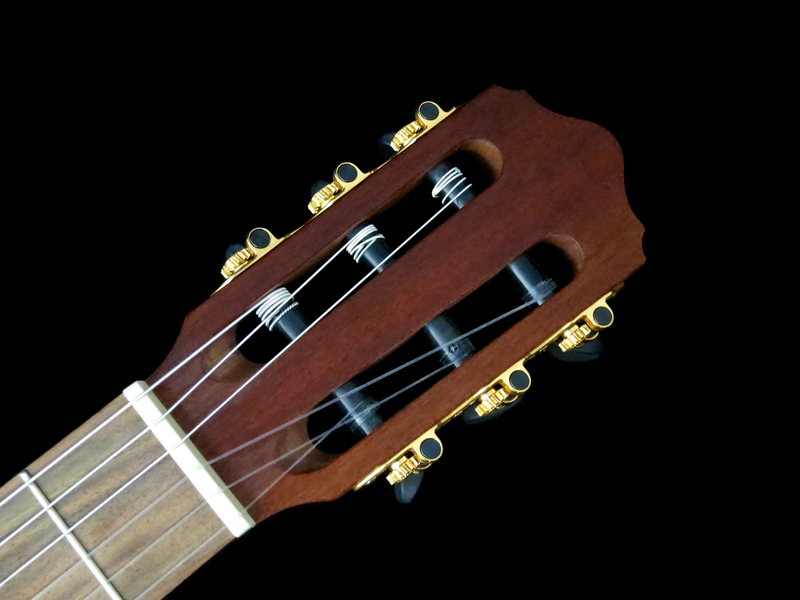 Torres mostly used cedar for his necks and rosewood for his fretboards. Most of his tops were made from solid spruce. His choice of sound box woods was more varied, though. His back and sides were made from rosewood, mahogany, (flame) maple, and cypress. Because cypress was a much cheaper wood in Torres’ time than, say, rosewood, cypress body instruments were usually the least expensive. 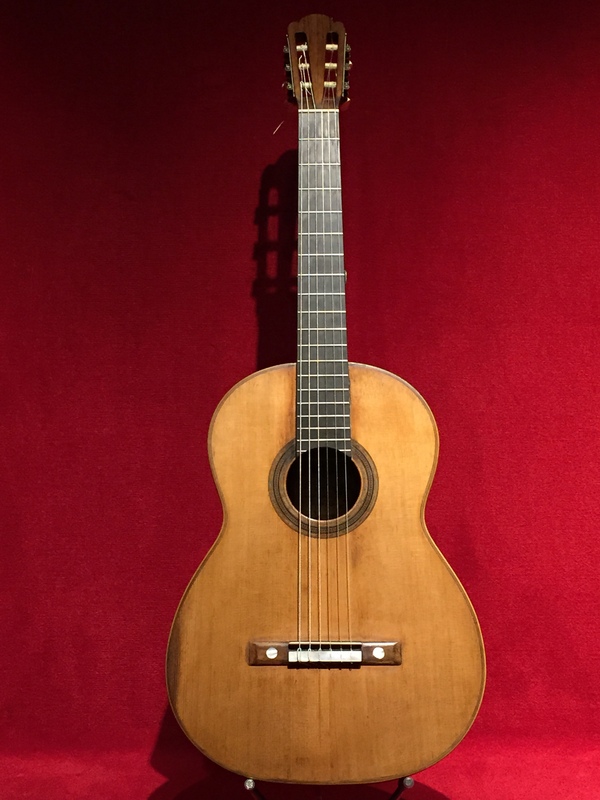 Most flamenco guitarists of that time were cash-strapped, which is why they tended to play Torres’ cypress guitars. 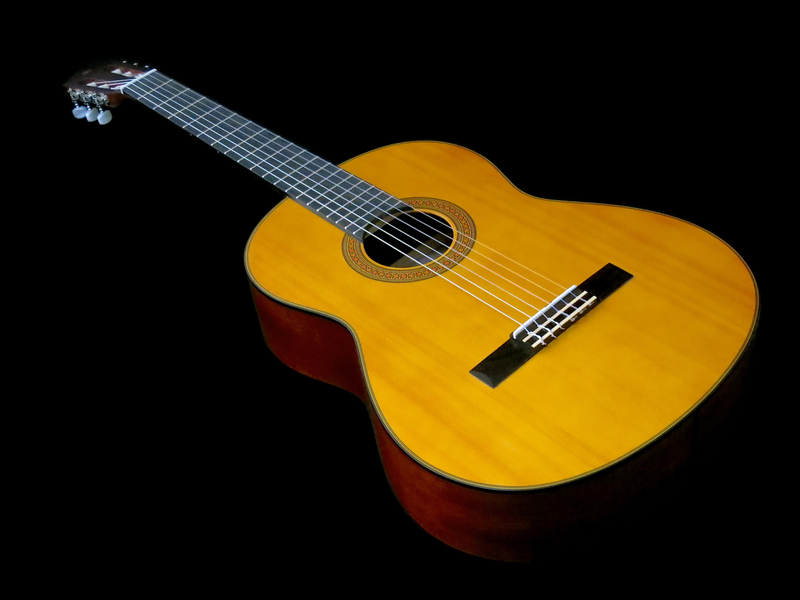 This, in turn, is the reason why many flamenco guitars are still made with cypress backs and sides today. Most modern classicals are built with dovetailed glue joints – the neck and sound box are made separately, and only glued together relatively late in the building process. The neck blank and the neck block are made from one piece of wood, with the neck block looking like an angular ”U” or ”L” (viewed from the side). Either side of the neck blank has a deep groove for the rims to be glued into. The neck blank and sides together then constitute a frame for the top and back. I feel like a sleazy gameshow host writing this, but there aren’t really any losers in this round-up. All ten guitars are real instruments that are well up to the job of making beautiful music. Still, it is very interesting to take a look at the different ways modern manufacturers use to re-interpret Torres’ time-honoured concept for the modern player. 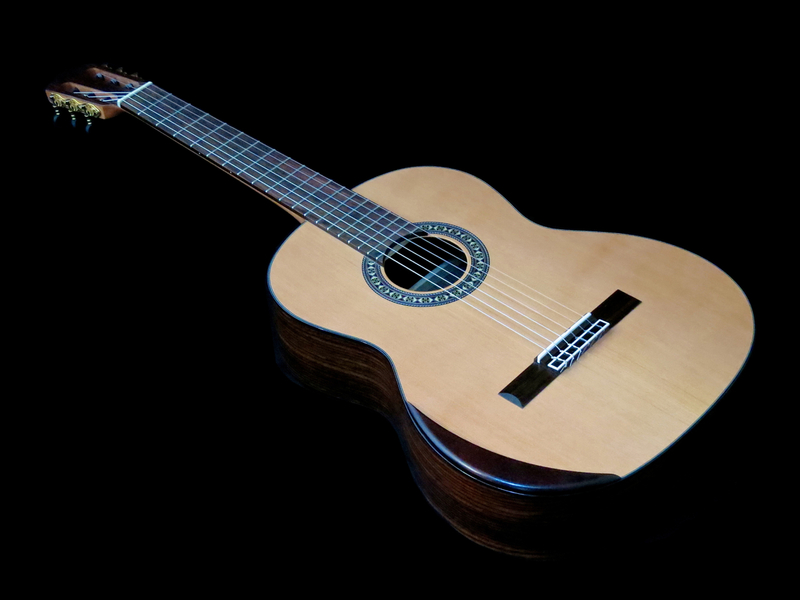 Admira is one of the largest makers of classical guitars in the world. German-born Enrique (orig. Heinrich) Keller founded an instrument workshop in northern Spain in 1944. Over time Admira has grown from a small maker into a well-known brand. 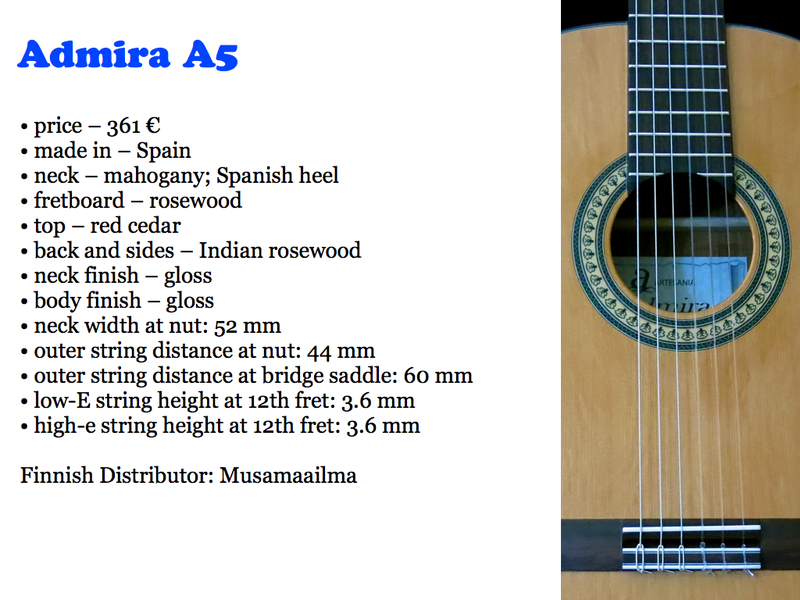 Admira guitars are distributed by Musamaailma in Finland. 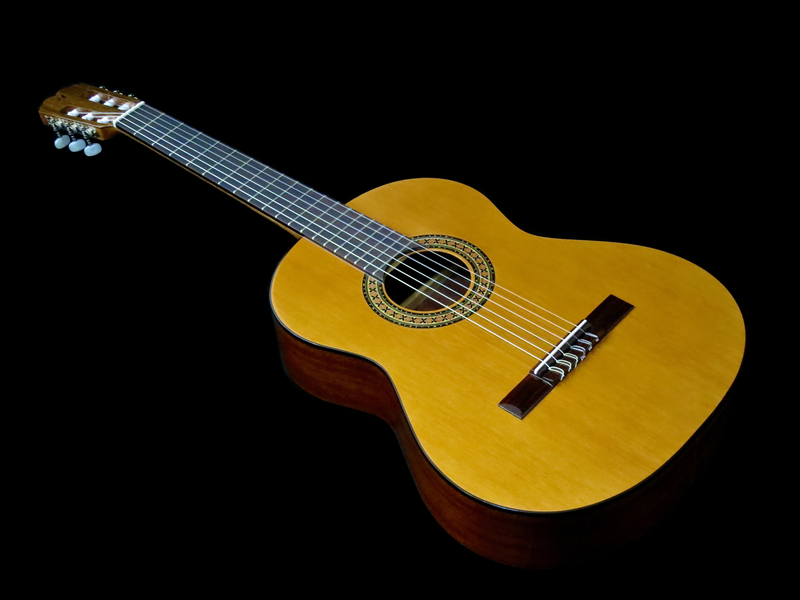 The Admira A5 is an affordable instrument from the Spanish maker’s Handcrafted-series. The workmanship is crisp and clean. The thin finish brings out the beauty in the A5’s woods. 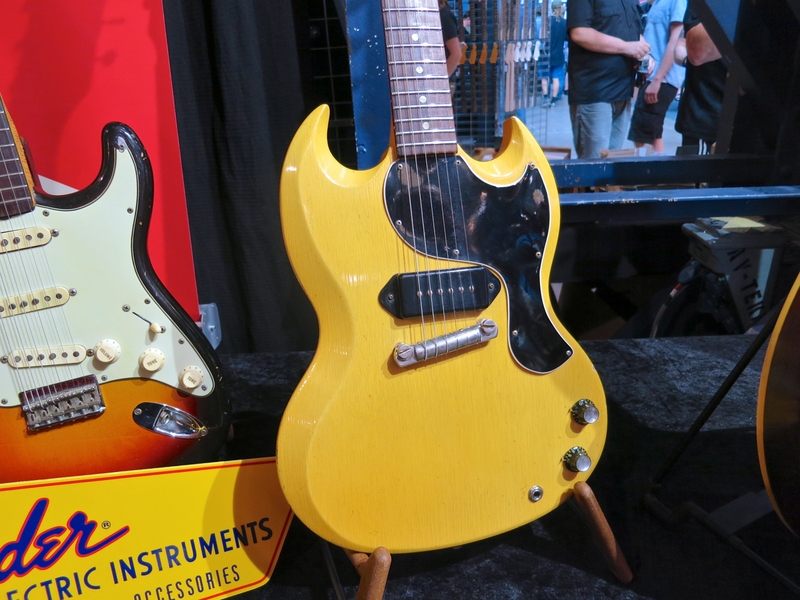 The golden tuning machines with their pearloid knobs add a nice touch of bling. 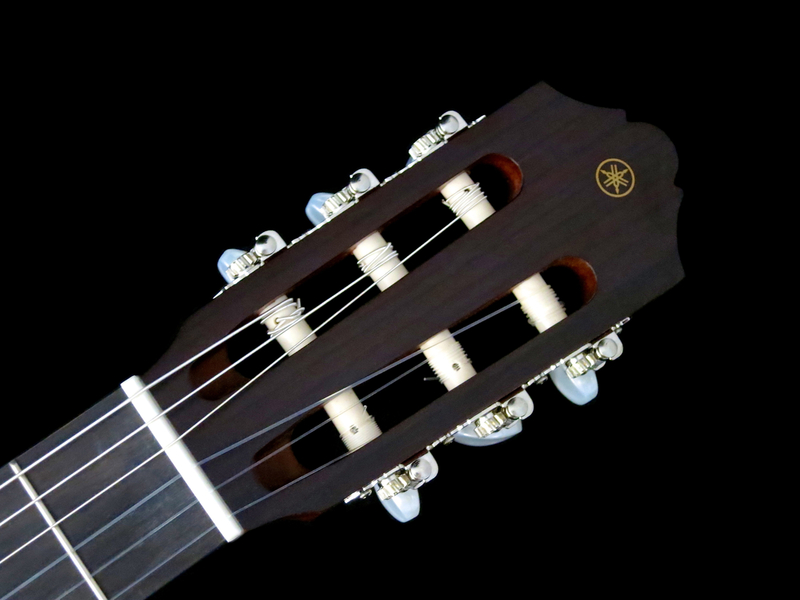 The rosette is unusual, displaying a chain of little guitars in a row. Admira’s A5 is one of three instruments in this round-up built with a Spanish heel. The neck profile is genuinely classical, meaning the neck is wide and flat with slightly angular shoulders. The moderate action results in a very comfortable playing feel. The Admira A5 has a big voice with an even balance between its chunky bottom end and clear treble attack. Admira’s Malaga is part of their Student-range. The Malaga is one of the lightest instruments in this review. The workmanship on this cedar-topped beauty is excellent. 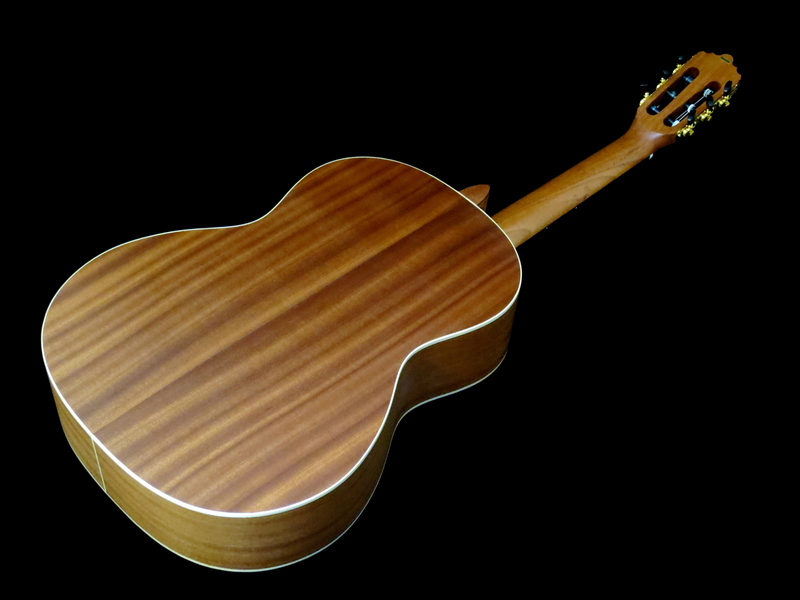 The affordable nature of this guitar is only reflected in the very clean, but thinner-than-usual (non-kerfed) wooden linings joining the top and back to the sides. 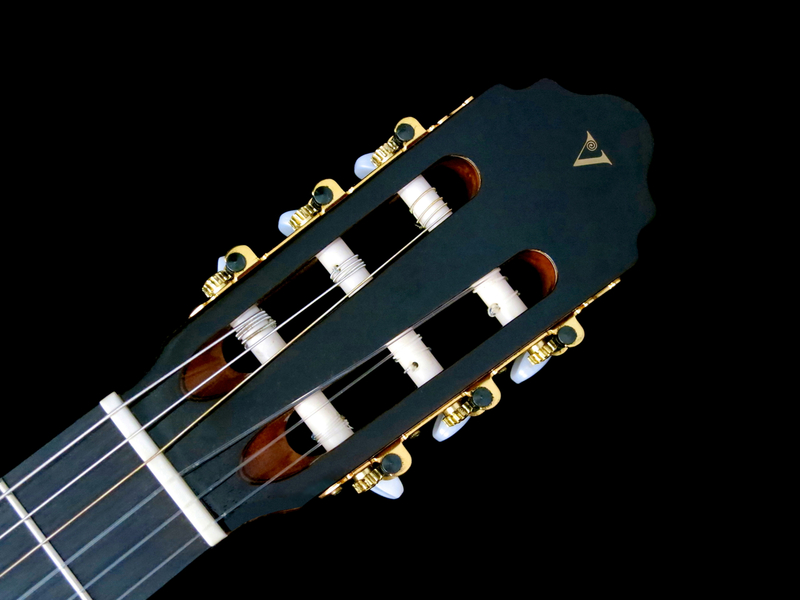 The neck profile on the Admira Malaga is traditional. The review sample came with a surprisingly low action (for a nylon-string). 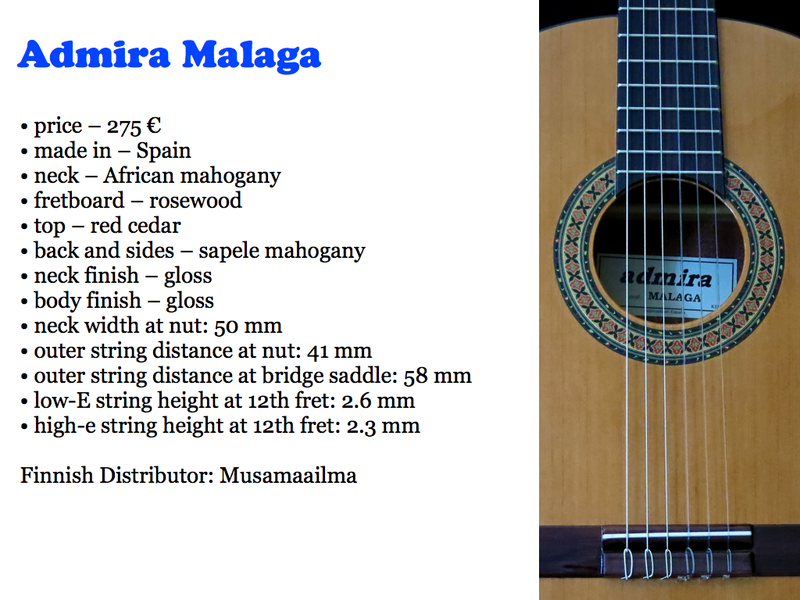 This makes the Malaga an excellent choice for a beginner, but also a very viable candidate for flamenco players, who prefer a very fast action and a clicking attack. 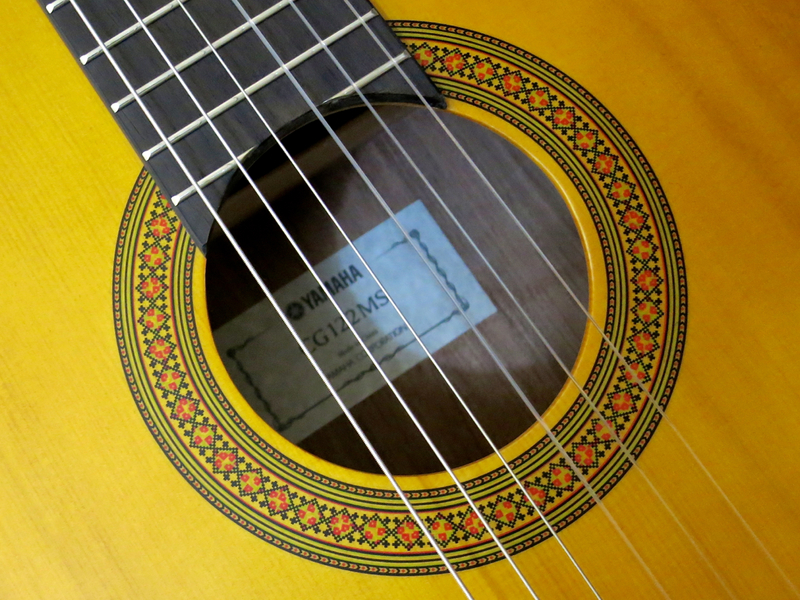 Despite its very low action the Malaga plays with a clear and strong voice, completely devoid of string buzz or rattles. 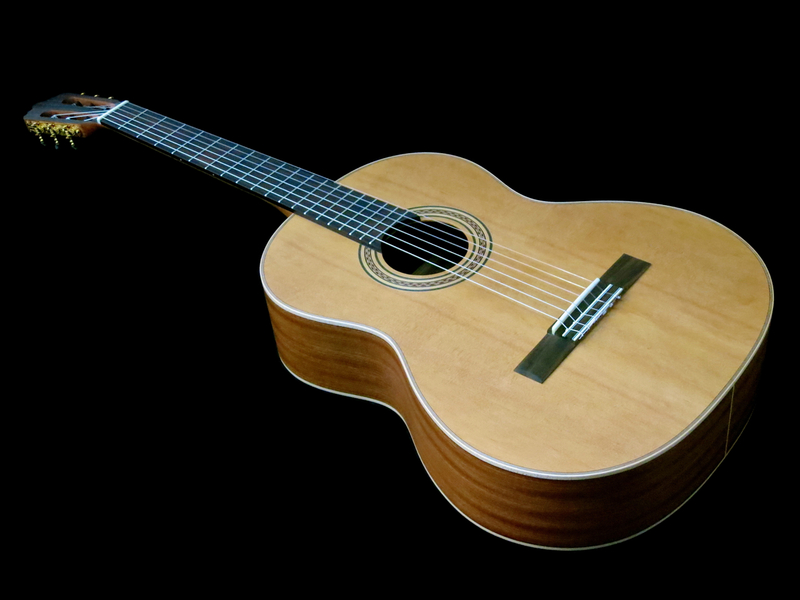 Esteve is a very traditionally-minded Spanish maker of classical guitars. 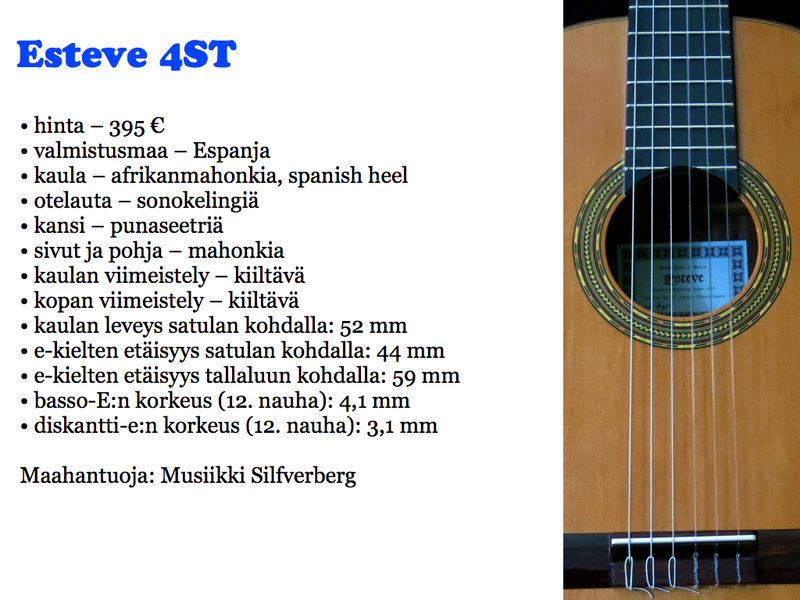 Esteve guitars are imported by Musiikki Silfverberg. Our review sample was kindly provided by Vantaan Musiikki. The Esteve 4ST is an instrument from the maker’s Student-range. 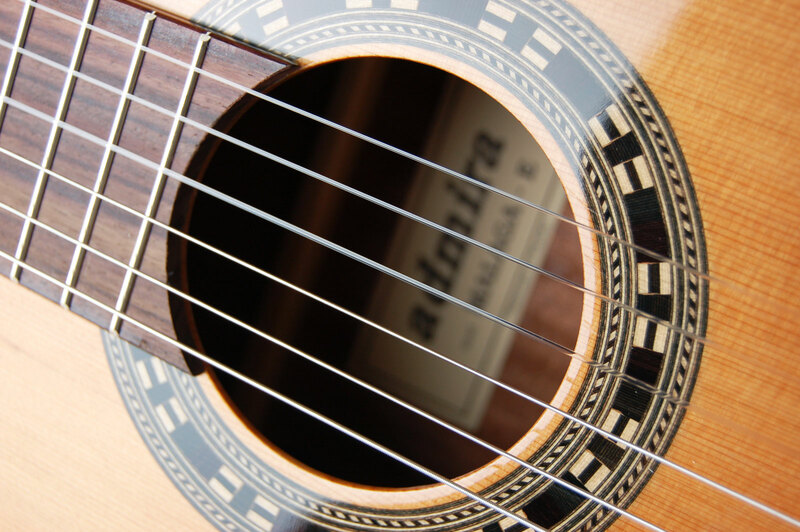 This guitar is a real beauty with its tinted cedar top and its intricate soundhole rosette. Spanish style at its best. 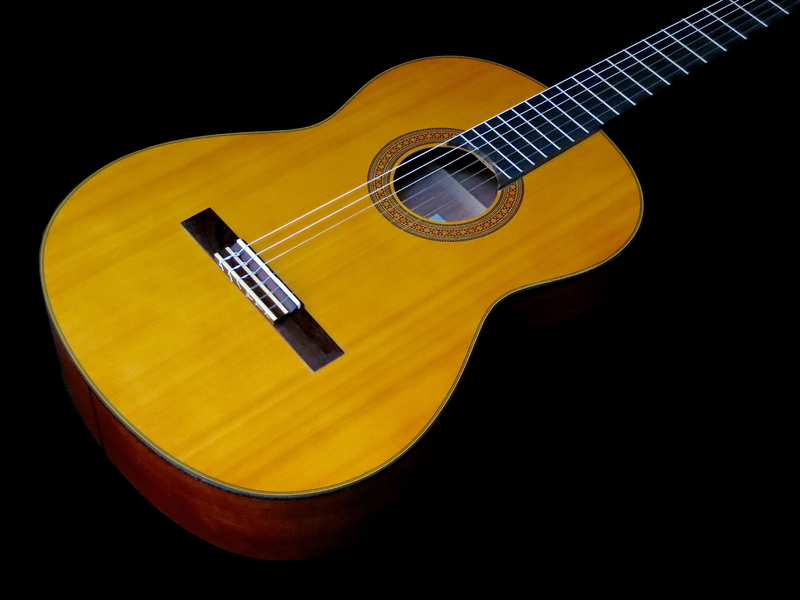 The 4ST is the second guitar (of three) in this round-up that sports a Spanish heel. The workmanship is very crisp throughout. 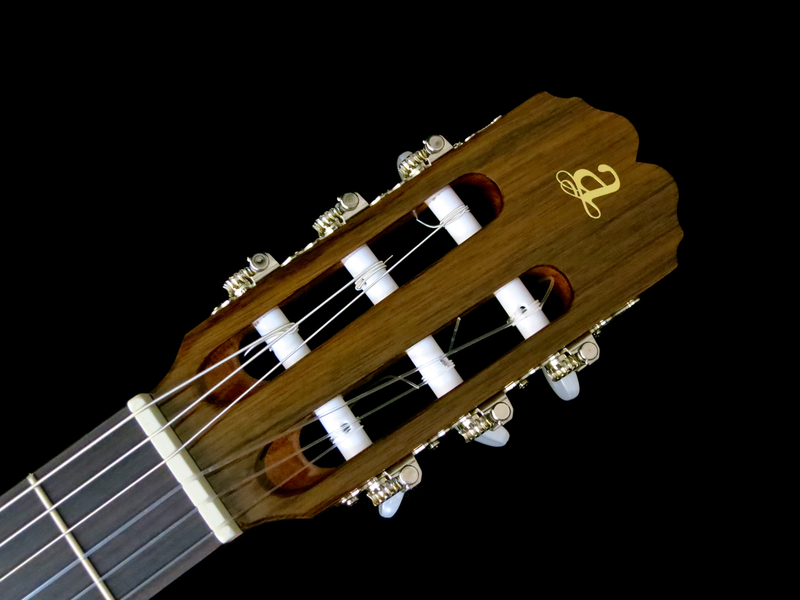 Esteve’s neck profile is genuinely classical – wide and flat. The action is at traditional settings. The guitar plays like a breeze. 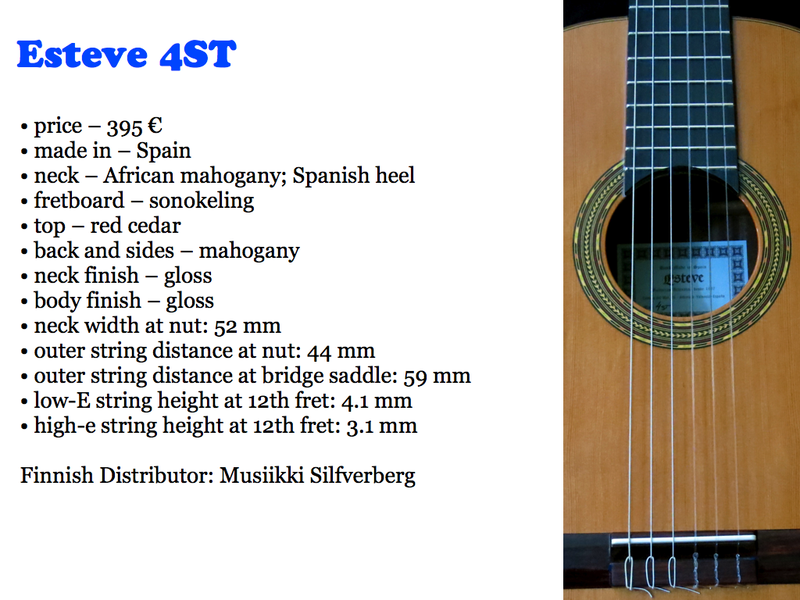 Esteve’s 4ST has a huge and deep tone, which is warm and well-balanced. The instrument’s attack is clear and precise. Kantare Guitars are a celebration of Finnish knowhow and ingenuity. 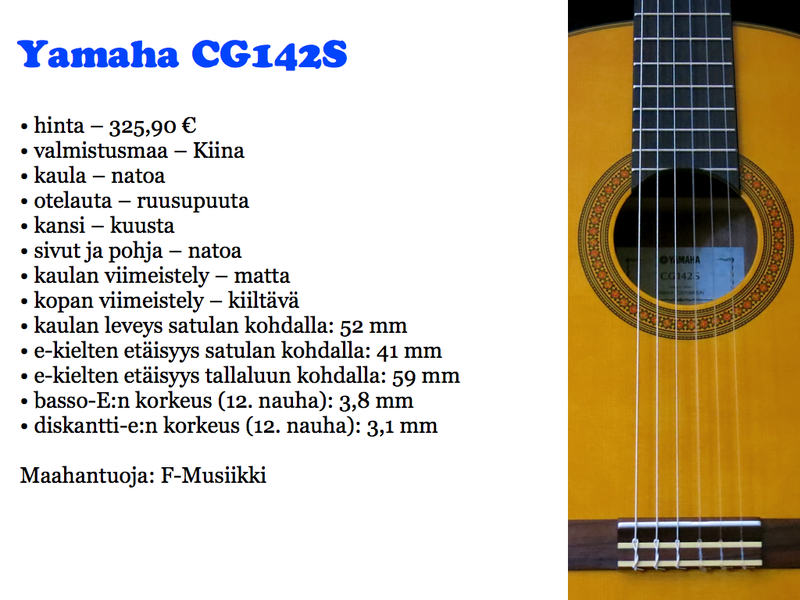 Kantare guitars are designed in Helsinki by the grand old man of Finnish luthiery, Kauko Liikanen. 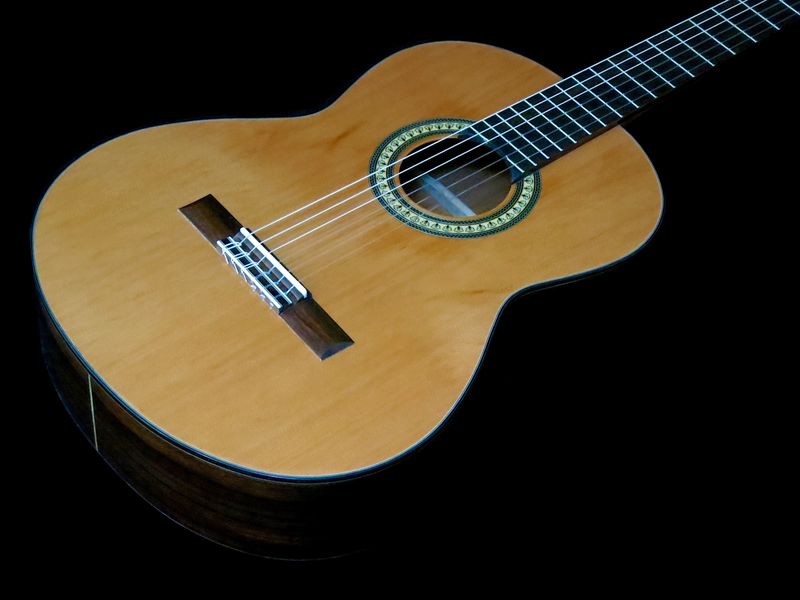 The special top bracing system sets these guitar apart from any other nylon-string. Instead of the traditional fan bracing (or a variation thereof), Kantares employ the patented LRS-bracing. Kauko Liikanen’s and Uwe Florath’s Lens Resonance System concentrates an oval pattern of braces around the top’s bridge area. The sound is concentrated in a way not dissimilar to an optical lens. LRS adds strength to the bridge area, while letting the rest of the top vibrate more freely than traditional bracing patterns. Most Kantares are built in Romania. Hora is one of Europe’s largest makers of string- and bowed instruments. Kantare’s Finnish distributor is Liikanen Musical Instruments. 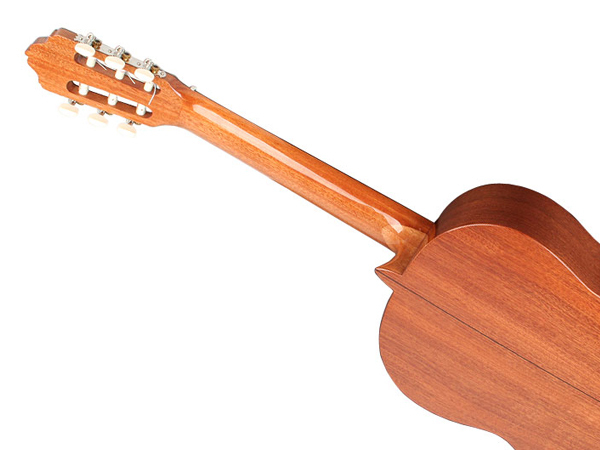 The Kantare Dolce C hg is a gloss-finished guitar with an LRS-braced cedar top. Our review sample sports Kantare’s brand-new arm rest, which is sold separately. The arm rest has been developed to put your plucking arm into a comfortable playing position, as well as to minimise top damping. 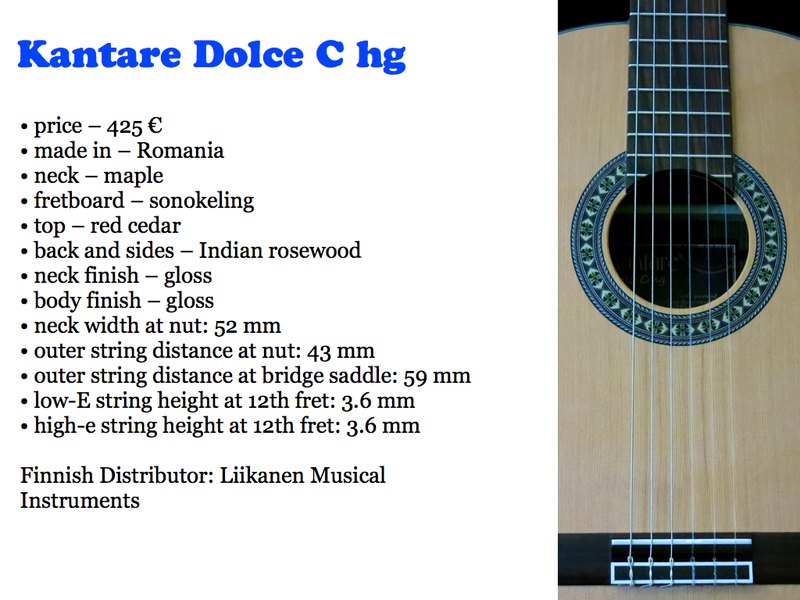 The Dolce C hg is a very beautiful, cleanly built instrument. 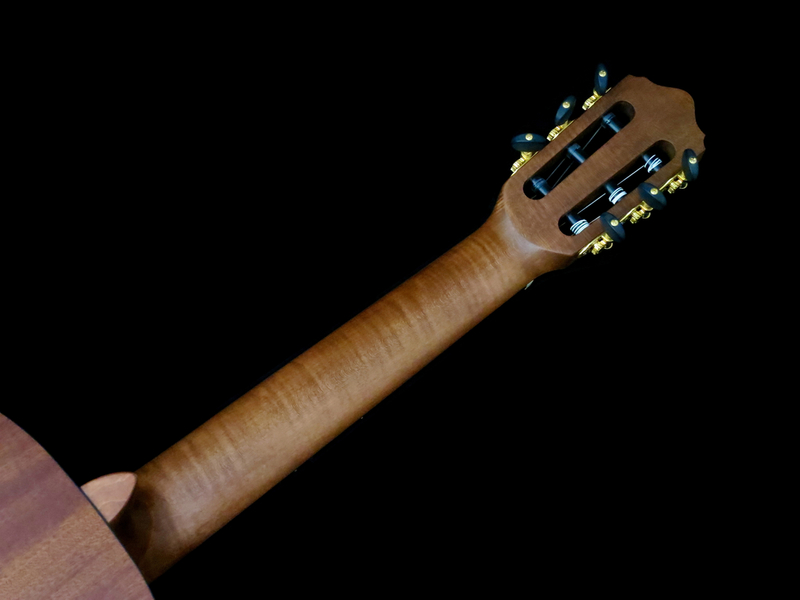 Apart from the LRS bracing, a common denominator among most Kantare models is a maple neck. Classical guitars traditionally feature mahogany or cedar necks; on the other hand, most bowed instruments use flame maple necks. 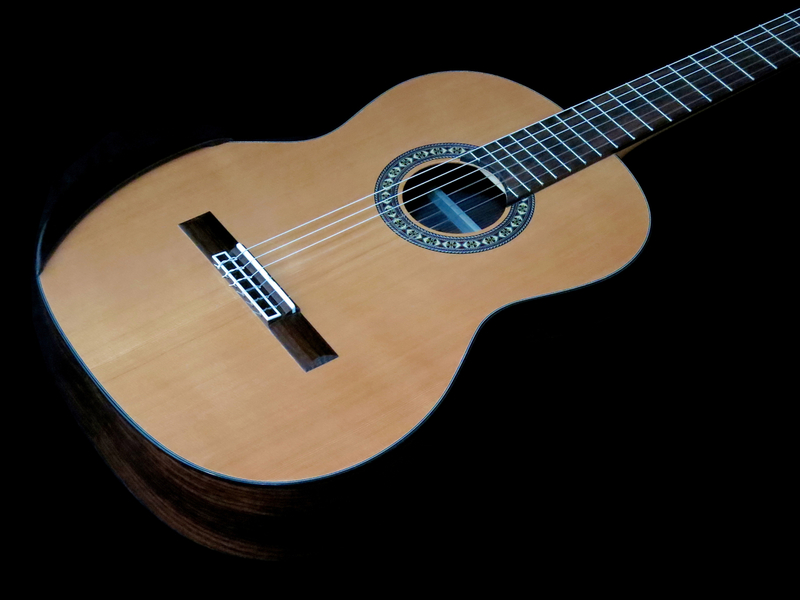 The strength and density of maple makes it an enticing choice for use in a classical guitar neck, too, and the Hora factory has a large stock of flame maple. 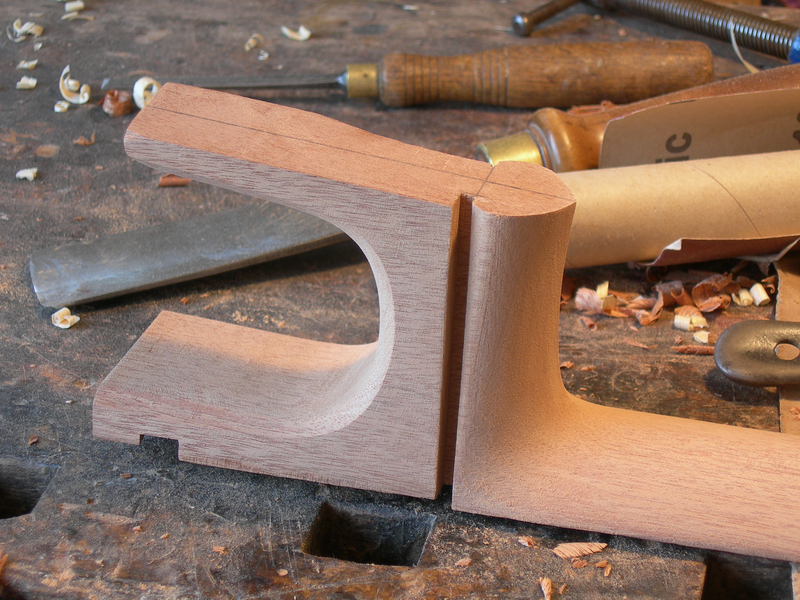 Kantare’s Hauser-style machine heads are of very decent quality, and work precisely. 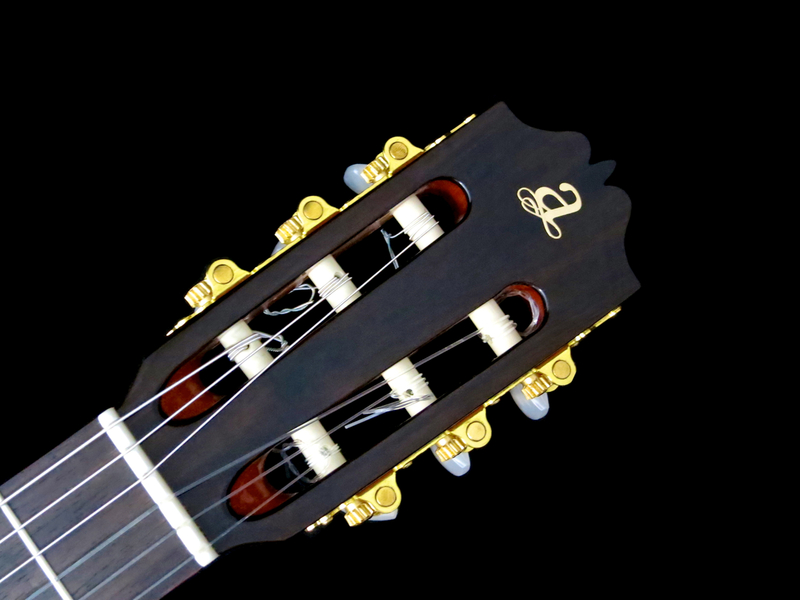 The Dolce C hg’s neck profile is noticeably more rounded than a traditional Spanish neck, probably making this neck feel more comfortable for many. To help the beginner with finding the right fret positions, Kantare have included side dots at the fifth and seventh frets. 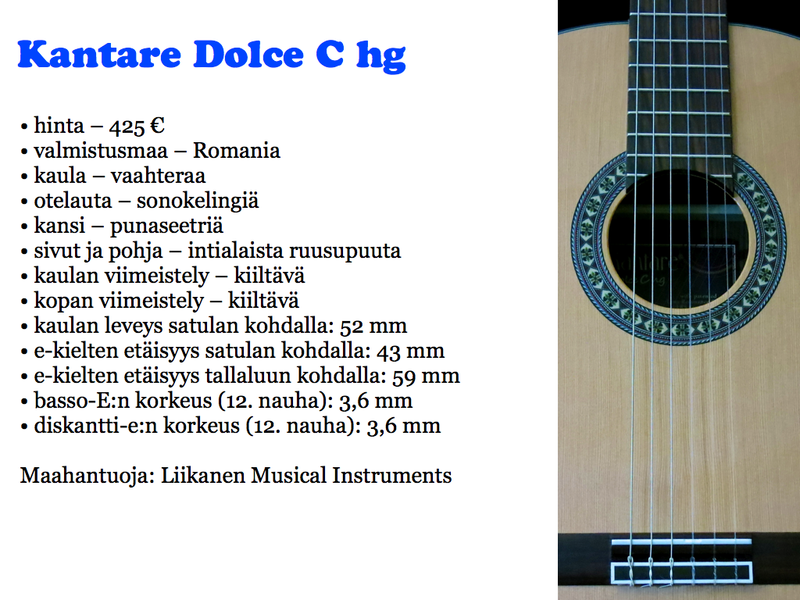 The Kantare Dolce hg has quite a loud voice and projects nicely. The sound is clear and precise. Kantare’s Vivace C features a brand-new, ecologically sound satin finish. The Vivace C is finished using a new German-made (by Hesse Lignal) non-poisonous product, called Proterra Resit. Proterra Resit uses a novel mixture of shellac, oil and carnauba wax. Shellac (also called French polish) is an organic polymer that has been in use by instrument makers for centuries. Traditional French polish is very time-consuming and work-intensive in use, which is why you’ll find it on only a limited number of handmade instruments. The huge advantage of Proterra Resit lies in the fact that it is quick and easy to apply. 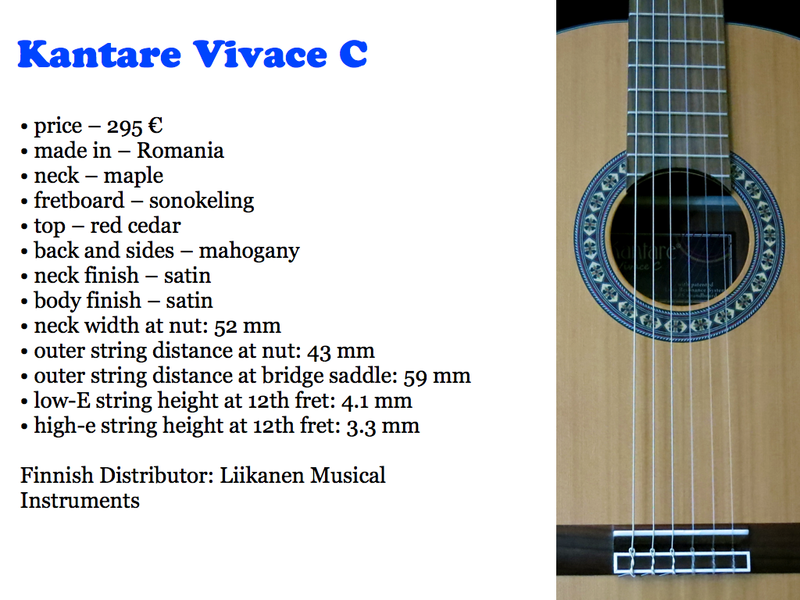 The Kantare Vivace C looks and feels very ”eco” and ”organic”, in the best sense of these terms. The new finish nicely accentuates the beautiful wood grain of the guitar’s maple neck. 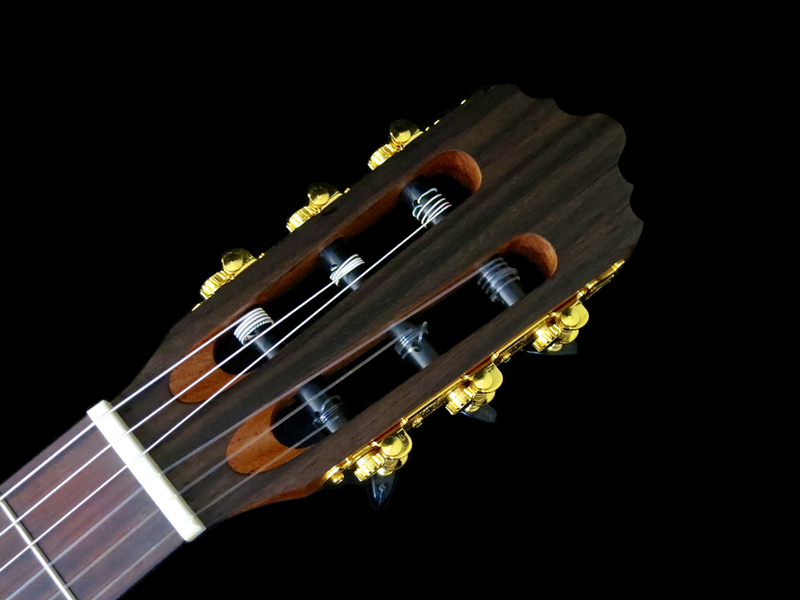 The neck profile is rounder than a traditional classical guitar neck, and there are two side dots (at the fifth and seventh frets) on this Kantare, too. The Vivace C’s voice is very woody and a little bit dry. 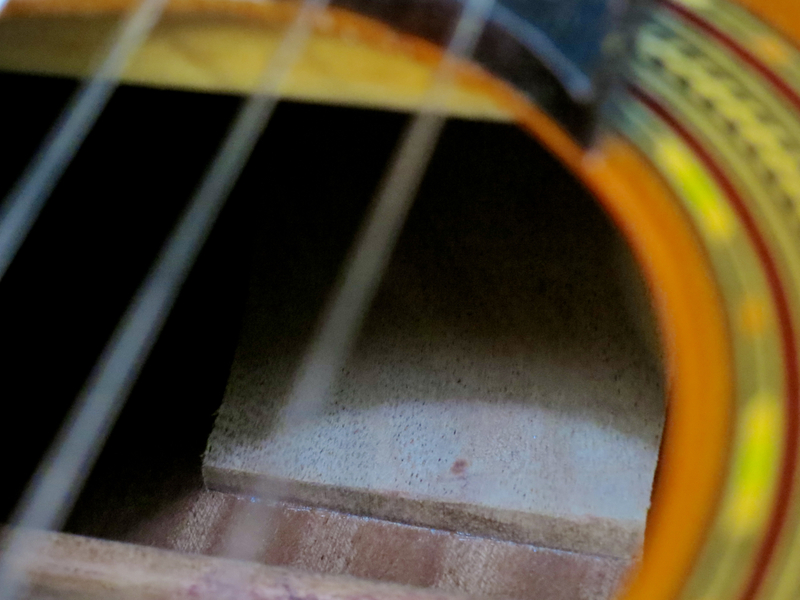 You can clearly hear the wood amplifying the string vibrations. The bottom end isn’t overpowering, the mid-range is warm, and the trebles sound open, but never too bright. LaMancha is a young brand from Germany. 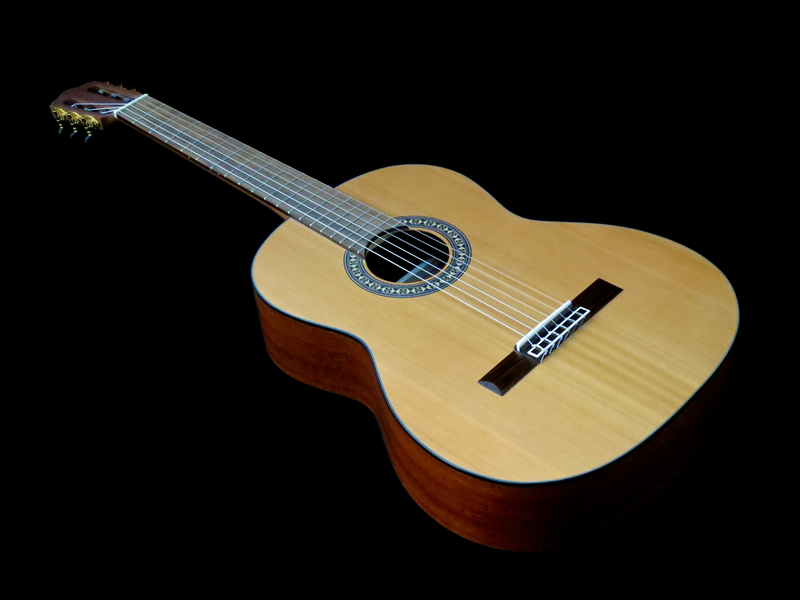 LaMancha-instruments are design in Germany and made in China (under German supervision), in the company’s own factory. 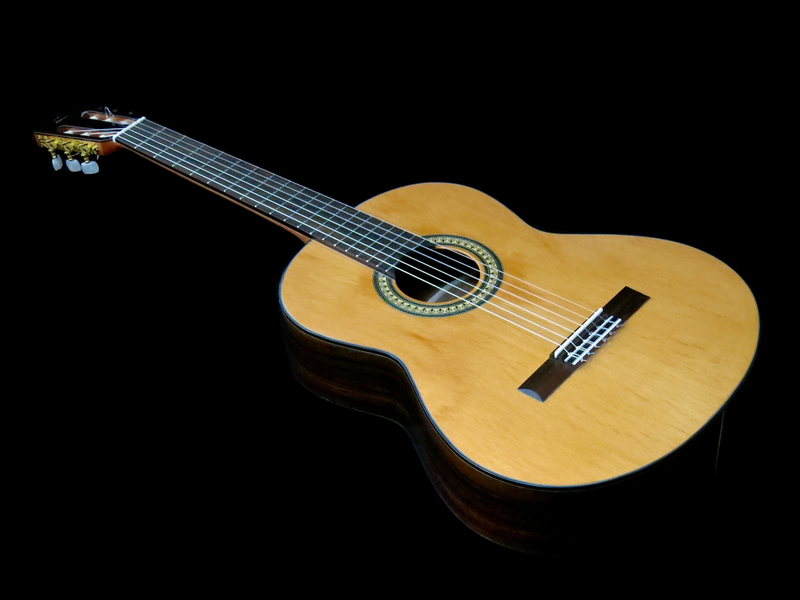 LaMancha has managed to become Germany’s best-selling brand of classical guitars over the course of just a few years. 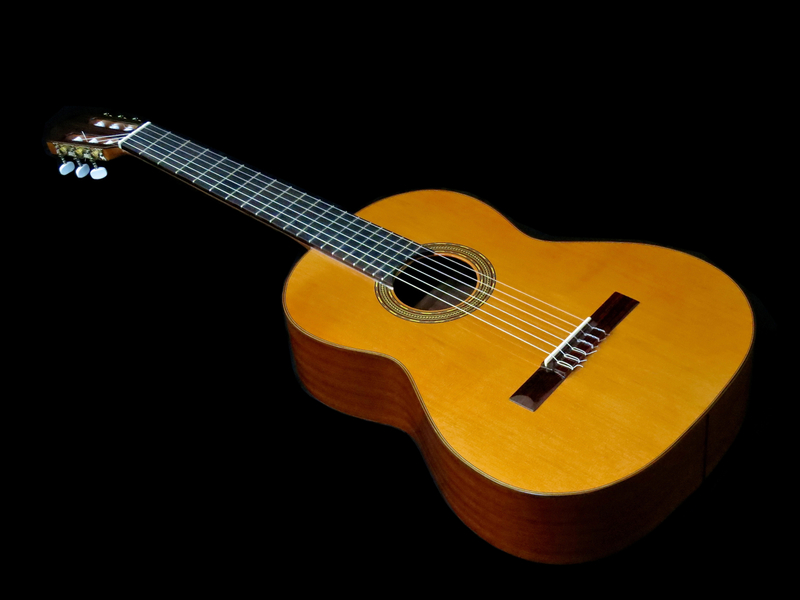 Many of their models have already won awards by the European Guitar Teachers Association. LaMancha’s distributor in Finland is Musiikki Silfverberg. Our review instrument was kindly provided by Vantaan Musiikki. 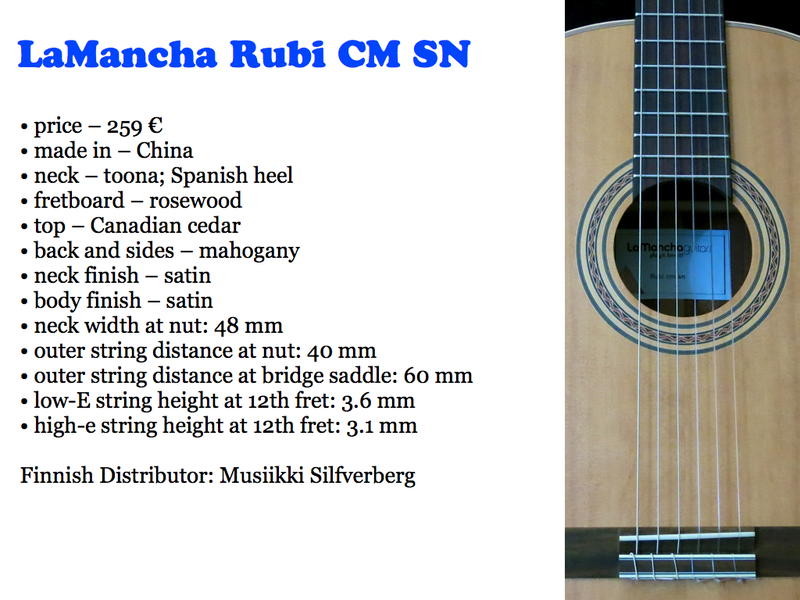 LaMancha’s Rubi CM SN is a satin-finished guitar with a narrower-than-usual neck (LaManch call it ”Small Neck”), making it a good choice for young students and players with small hands. The Rubi CM SN is the third guitar in this round-up constructed around a Spanish heel. The neck is made from toona, a south Asian relative of cedar, that also grows in Australia. The neck is stiffened by two graphite rods, which have been inserted into the neck from the front, prior to the fretboard being glued on. The workmanship on this LaMancha is very clean. The Rubi CM SN is a very stylish and lightweight guitar. 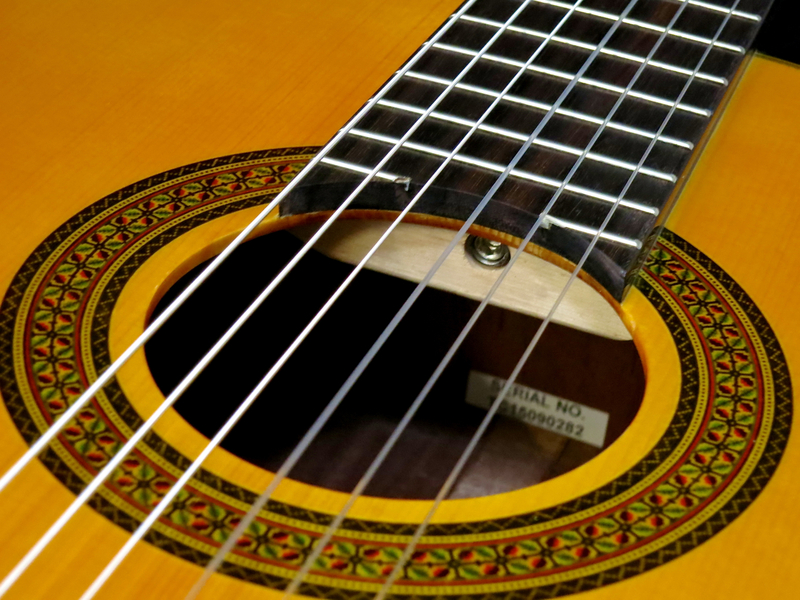 The Rubi’s neck profile is narrower and rounder than that of a traditional classical guitar. There are two small side dots in the fingerboard for orientation. The LaMancha plays like a dream. The Rubi CM SN displays a well-balanced voice with a slender bass register and a woody top end. 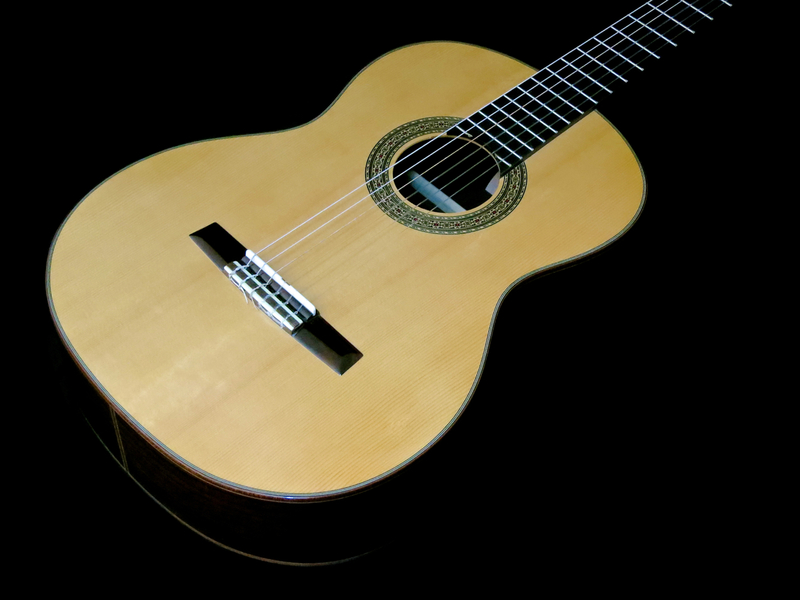 Japanese company Takamine is best known for its acoustic-electric steel-string guitars, but the company has always made classical guitars, too. Takamine’s Finnish distributor is EM Nordic. The test instrument was kindly provided by DLX Musiikki. The Takamine GC3-NAT is a spruce-topped classical guitar made in China. The top’s yellow tint is reminiscent of the look of French polish. 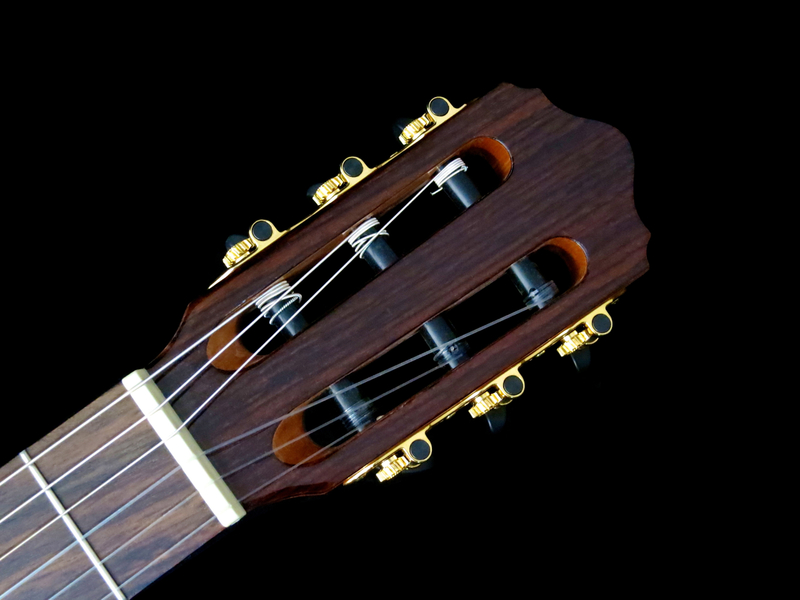 The stark and unadorned rosewood bridge of the GC3-NAT is a stylish contrast to the instrument’s beautifully intricate soundhole rosette. 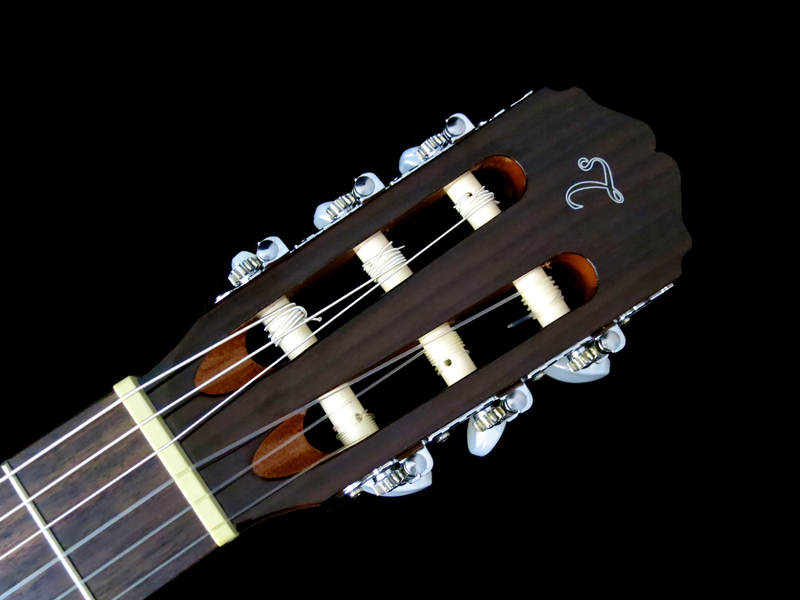 Takamine is one of the very few makers of Spanish guitars who uses a truss rod inside their nylon-string guitars’ necks. The GC3-NAT’s neck profile conforms to tradition – it’s wide, flat, and a touch angular. The action is low-ish (for a classical), making for a very comfortable playing feel. This Takamine needed a bit of breaking in to realise its potential fully, but it was well worth the effort. 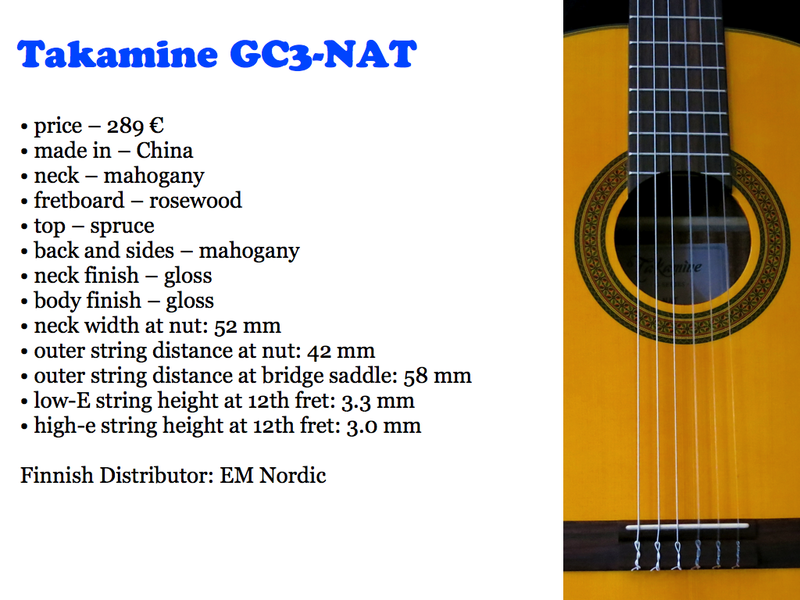 The GC3-NAT has a beautiful and fluid voice, a clean and open mid-range, as well as a precise attack. Valencia was a new name to me, even though the company has been in existence since 1972. Valencia-guitars are designed in Australia, and built in several factories in China and Indonesia. Valencia’s Finnish distributor is EM Nordic. The review sample was kindly provided by DLX Musiikki. The spruce-topped Valencia GC50 is probably the most richly ornamented instrument in this review. There is multi-ply binding on both top and back, with the outermost ply being mahogany. The back’s centre seam has also been adorned with a mahogany inlay. 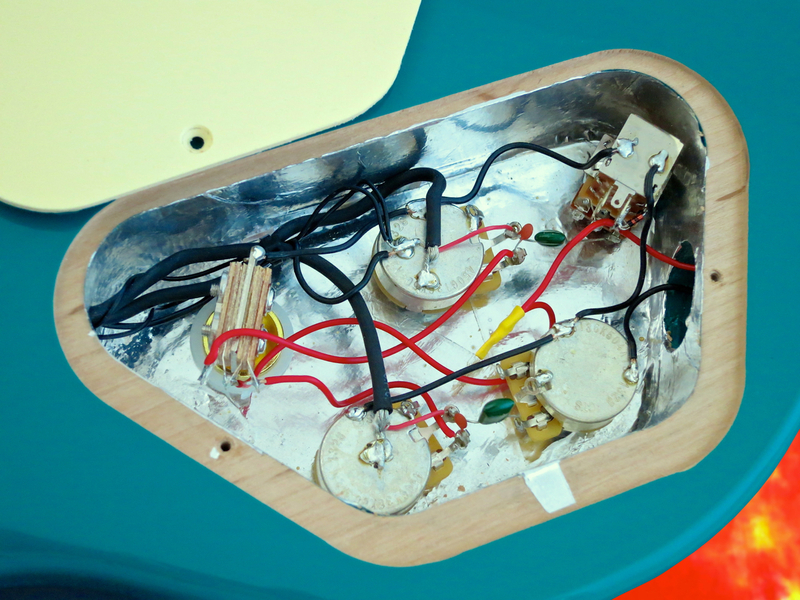 The neck of the GC50 is glued together from three side-by-side strips. The middle piece’s grain orientation is reversed to make neck warping less likely. Valencia’s neck profile is fairly traditional, with just a touch of added roundness. The action on our review instrument felt a bit high and stiff for my taste (I’m not Andrés Segovia). A guitar repairer (or a reasonably skilled guitarist) shouldn’t have a problem lowering the bridge saddle, though. Shaving off a millimetre, or so, should result in a much better playing feel. The Valencia GC50’s voice is beautifully lyrical and open. Even in the highest registers the notes still have an astonishing richness and depth. 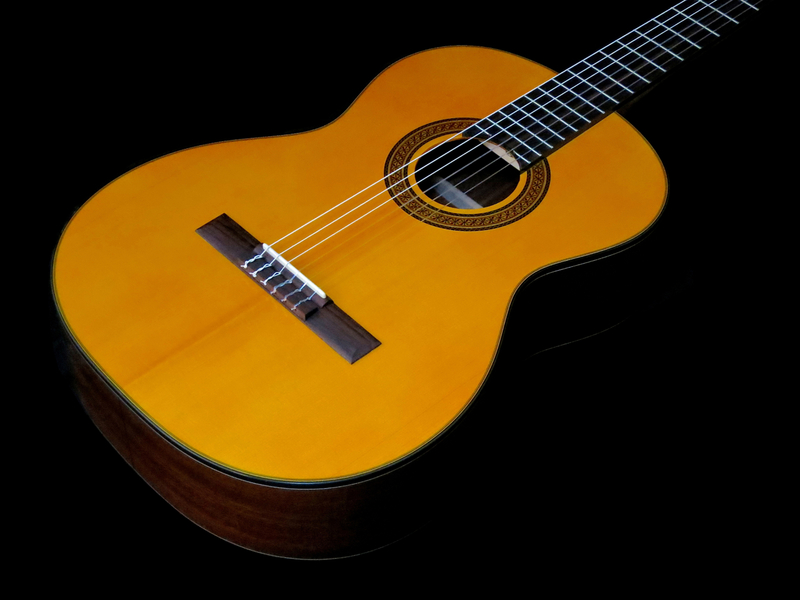 Classical guitars have always been a very important part of Yamaha Guitars’ wide range of models. The C40 is still the best-selling classical guitar on the planet. The more recent Concert Series bears testament to Yamaha’s ongoing commitment to research and development. Yamaha’s Finnish distributor is F-Musiikki. 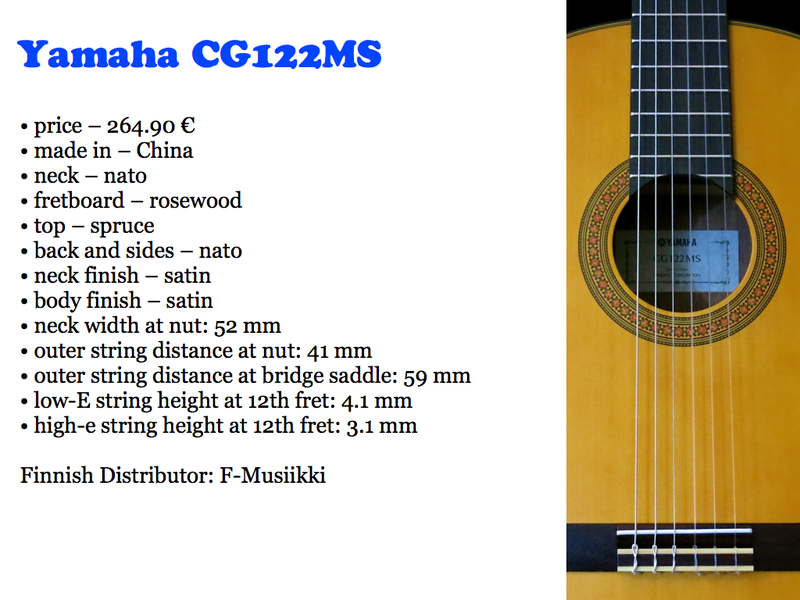 The Yamaha CG122MS is one of the most affordable Concert Series instruments. TheCG122MS’s matte finish is applied very thinly, which is great for tone and feels nice, too. 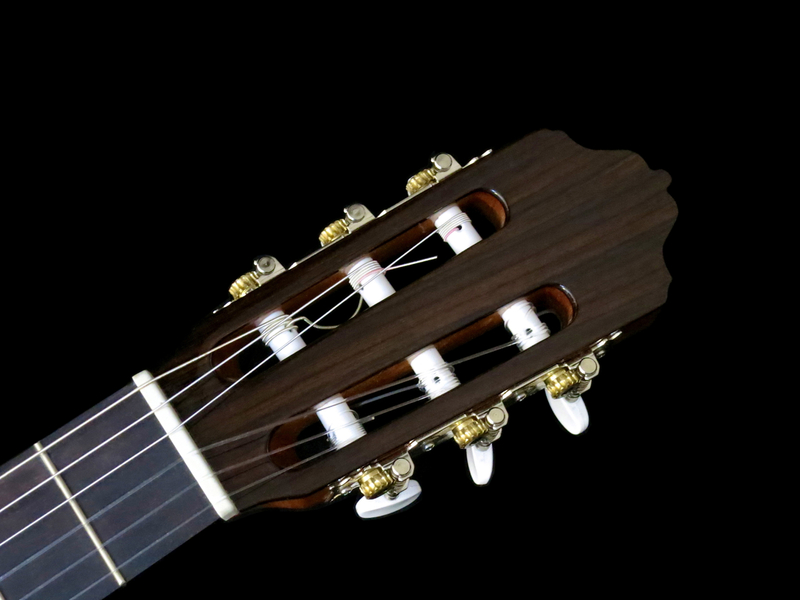 The CG122MS is a lightweight instrument with a slightly more rounded neck profile. Side dots at the fifth and seventh frets make finding your way around the fingerboard a little bit easier. The CG122MS plays very well with a nice, traditional action. The tone is warm and woody. The Yamaha sounds well-balanced, and displays a crisp and clear attack. The Yamaha CG142S is the only guitar in this round-up that combines a gloss-finished body with a satin-finished neck. Understated beauty is the thing with the CG142S. This is a very cleanly built guitar. On this Yamaha, too, the neck profile is a tad more rounded compared to a traditional neck profile. The playability is very comfortable. 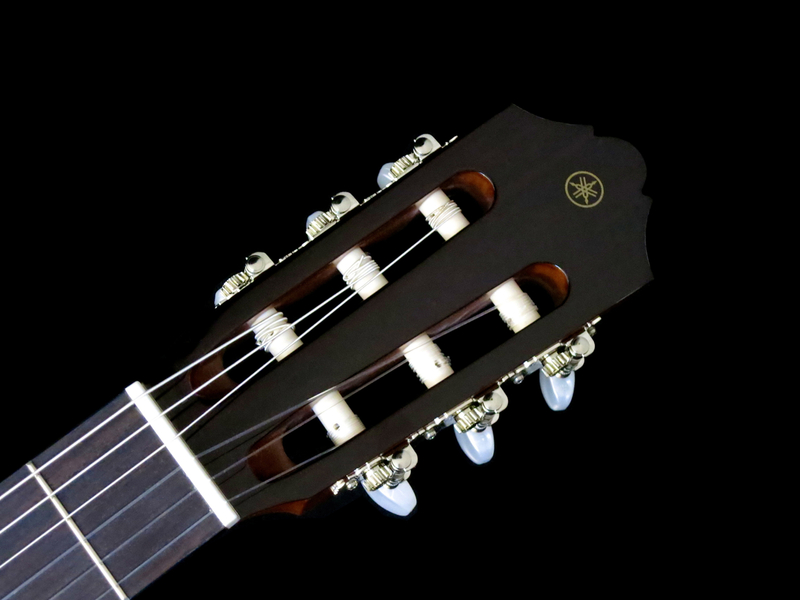 The CG142S’s fretboard also has a couple of side dots for easier orientation. 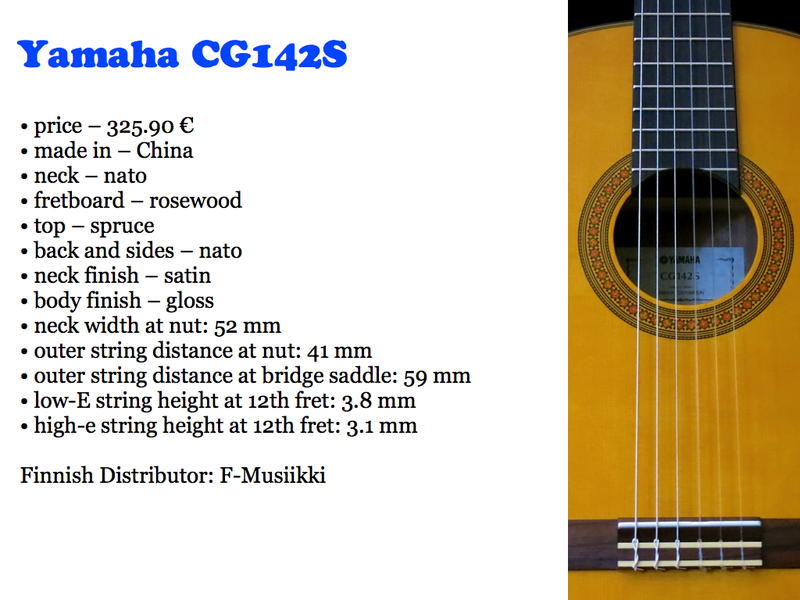 Yamaha’s CG142S sings with a well-rounded, beautiful voice. There’s a healthy amount of clarity in the mid-range. To summarise I could state the obvious – there are many well-built, well-playing instruments in the 250-400 euro price segment. There should be the right guitar for everyone, depending on finish, neck profile and sound preferences. Klassinen (nailonkielinen) kitara on yhä erittäin suosittu soitin. Monille klassinen kitara on se ensimmäinen soitin, jolla aloittelijan matka musiikin maailmaan alkaa. Tästä syystä Kitarablogissa päätettiin tehdä pieni katsaus tärkeän 250-400 euron hintasegmentin soittimista. Kohtuullisella satsauksella saa nykyään jo kunnon kitaran kokopuisella kannella. Kokopuisella kannella on iso merkitys soittimen sointiin, ja säännöllisesti soitettuna kansi herää henkeen ja kitaran luonne nousee esiin. Totta, vanerikannestakin lähtee ääni, mutta soitin soi aina vaisummin, eikä sen sointi kypsy ajan kanssa. Klassisen kitaran isä oli espanjalainen puuseppä ja soitinrakentaja Antonio de Torres Jurado (1817-1892). Torres antoi kitaralle sen lopullisen ulkomuodon, soittimen rakennustavan (esim. kannen rimoitus tai erillinen tallaluu) ja sen rakentamiseen sopivat materiaalit. Torres käytti suurimmilta osin kitaroissaan seetriä kaulamateriaaliksi ja ruusupuuta otelaudaksi. Kansi oli veistetty lähes poikkeuksetta kuusesta, mutta pohjan ja sivujen materialien suhteen Torresin soittimissa oli isompi vaihtelevuus. Kopat tehtiin ruusupuusta, mahongista, vaahterasta ja sypressistä. Koska sypressi oli jo Torresin aikaan huomattavasti halvempi puu kuin esimerkiksi ruusupuu, olivat sypressikoppaiset soittimet myös halvempia kuin muut mallit. Monilla flamenco-kitaristeilla oli tiukka rahatilanne, miksi he valitsivat usein juuri sypressi-kitaran. Tästä syystä myös tänä päivänä monien valmistajien flamenco-kitaroissa sivut ja pohja ovat sypressistä. Monissa nykypäivän klassississa kitaroissa on kaulaliitos toteutettu liimaamalla kaula kopassa olevaan kaulablokkiin. Kaula-aihio ja kaulablokki tehdään silloin yhdestä palasta. Aihion kummassakin sivussa on ura jonne liimataan kopan sivut kiinni. Tästä syntyy kehikko, johon lisätään kitaran pohja ja kansi. Tunnen itseni suomalaisen lastenohjelman juontajaksi, kun totean, että tässä kitarakatsauksessa ei ole häviäjiä. Jokainen esitelty kitara on oikea soitin, jolla voi tehdä kaunista musiikkia. On kuitenkin hyvin mielenkiintoista huomata eri valmistajien näkemykset toteuttaa Torresin klassikkoreseptiä tässä hintaluokassa meille nykymuusikoille. Admira on yksi isoimmista klassisten kitaroiden valmistajista maailmassa. Saksalainen maahanmuuttaja Enrique (saks. Heinrich) Keller perusti vuonna 1944 soitintehtaan Pohjois-Espanjaan. Ajan mittaan pienestä työpajasta kasvoi varteenotettava yritys. Admiran kitaroita tuo maahan Musamaailma. Admira A5 on edullinen malli espanjalaisvalmistajan Handcrafted-sarjasta. Kevyen soittimen työnjälki vaikuttaa erittäin siistiltä. Kitaran ohut lakkaus tuo A5:n puiden sävyt ja syykuviot sopivasti esiin. Pikantteina yksityiskohtina voi mainita mallin kultaiset virityskoneistot helmiäismuovisilla nupeilla, sekä A5:n hauska rosetti, jossa näkyvät pienet kitarat rivissä. Admira A5 on yksi tämän katsauksen kolmesta kitarasta, joilla on Spanish Heel -kaula. Kaulaprofiili on aidosti klassinen, mikä tarkoittaa leveää, laakeaa ja hartioissa aavistuksen verran kulmikasta. Maltillinen kieltenkorkeus tekee soittotuntumasta erittäin mukavan ja vaivattoman. Admira A5 -kitaralla on iso ja hyvin tasapainoinen ääni muhkealla bassolla ja selkeällä atakilla. Admira Malaga on Student-sarjan kitara. Malaga on yksi tämän katsauksen kevyimmistä soittimista. Seetrikannella varustetun kitaran työnjälki on erinomaisen siisti, ja lopputulos on hyvin kaunis soitin. Malagan alhainen hinta näkyy ainoastaan kopan sisäisistä – sivuja pohjaan ja kanteen liittävistä – tukirimoista, jotka ovat nekin hyvin siistejä, mutta yksinkertaisemmat ja ohuemmat. Admira Malagan kaulaprofiili on perinteisen klassinen. Yllättävän matala kieltenkorkeus helpottaa kitaran soittotuntumaa aloittelijoille sopivaksi, mutta se tekee tästä mallista myös erinomaisen flamenco-soittimen, sen tuoman napsakan atakin ansiosta. 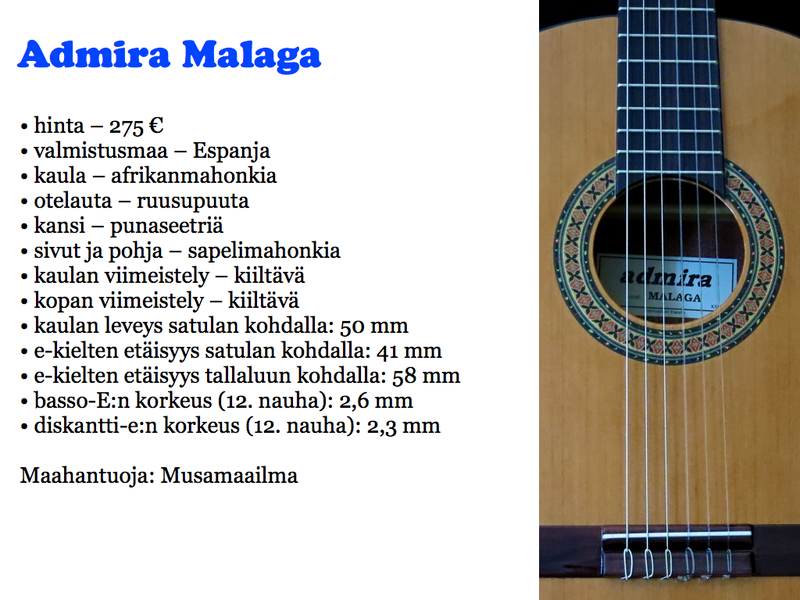 Matalasta ja nopeasta tatsista huolimatta Malaga soi siististi ilman kielten sirinää, ja kitaralla on iso ja täyteläinen ääni. Esteve on hyvin perinnetietoinen klassisten kitaroiden valmistaja Espanjasta. Esteven soittimia tuo maahan Musiikki Silfverberg. Saimme testisoittimen lainaksi Vantaan Musiikilta. Esteven 4ST on valmistajan Student-malliston soitin. Seetrikannen tumma viimeistely ja erittäin kaunis rosetti antavat tälle kitaralle hyvin tyylikkään ilmeen. 4ST on toinen kitara tässä katsauksessa, joka on rakennettu espanjalaisella jallalla. Työnjälki on kauttaltaan hyvin siisti. Esteven kaulaprofiili on aidosti klassinen – leveä ja laakea. Kieltenkorkeuskin on perinteisissä lukemissa. Soittotuntuma on hyvin mukava. Esteve 4ST soi voimakkaalla äänellä, joka on lämmin ja tasapainoinen. Kitaran atakki on mukavan selkeä. Kantare-kitarat ovat suomalaisen tietotaidon ja kekseliäisyyden tuotoksia. Kantare-soittimet ovat suomalaisen kitararakennuksen grand old manin, Kauko Liikasen, suunnittelemia. Kansirimoitus on näissä kitaroissa hyvin erilainen perinteisen viuhkaa muistuttavan rimoitukseen (fan bracing) verrattuna. Kauko Liikasen ja Uwe Florathin keksimä LRS-rimoitus (Lens Resonance System) keskittää rimoituksen optisen linssin tavoin tallan ympärille. LRS:n suurin etu on, että kitaran kansi voi värähdellä vapaamin kuin perinteisen rimoituksen kanssa, samalla kun tuetaan tallan ympäröivä aluetta paremmin. Soittimet valmistetaan Romaniassa. Valmistaja Hora on yksi Euroopan suurimmista akustisia kieli- ja jousisoittimia valmistavista yrityksistä. Kantaren maahantuoja on Liikanen Musical Instruments. Kantare Dolce C hg on kiiltäväksi lakattu kitara LRS-rimoitetulla seetrikannella. Testikitaraan on asennettu Kantaren uusi käsivarsituki, joka on saatavilla pieneen lisähintaan. Tuella saadaan soittajan käsivarsi mukavaan soittoasentoon, ja se estää samalla myös käsivarrren aiheuttamaa kannen demppausta. Dolce C hg on erittäin siististi rakennettu ja hyvin tyylikäs soitin. LRS-rimoituksen lisäksi toinen mielenkiintoinen ominaisuus monissa Kantare-soittimissa on niiden loimuvaahterasta veistetyt kaulat. Klassisissa kitaroissa käytetään yleisesti mahonkia tai seetriä kaulan materiaaleina, kun taas jousisoittimissa vaahtera on yleisin puulaji. Vaahteran lujuus on mainio peruste sen valinnalle myös klassisen kitaran kaulapuuksi, ja Hora-tehtaalla on isot loimuvaahteravarastot. Kantaren uudet virityskoneistot ovat hyvin laadukkaita ja toimivat pehmeän sulavasti. Dolce C hg:n kaulaprofiili on selvästi pyöreämpi kuin perinnekauloissa, mikä voi olla monien mielestä mukavampi vaihtoehto. Aloittelijoille oikean nauhan löytämistä helpotetaan pienillä dot-merkeillä viidennen ja seitsemännen nauhan kohdilla. Kantare Dolce hg on varsin äänekäs kitara. Sen soundi on hyvin erotteleva selkeällä atakilla. Kantare Vivace C on mattaviimeistelty uudella, ekologisilla tavalla. Vivace C:n mattaviimeistelyssä käytetään saksalaisen Hesse Lignal -firman uutta, myrkytöntä Proterra Resit -pintamaalia. Proterra Resit perustuu uudenlaiseen sekoitukseen šellakasta, öljystä ja carnauba-vahasta. Šellakka on orgaaninen polymeeri, jota on käytetty jo hyvin pitkään esimerkiksi jousisoittimien viimeistelyssä. Perinteisesti šellakkaa on hyvin työlästä levittää ja käyttää, minkä vuoksi sitä käytetään nykyään vain kalliissa soittimissa. Uusi Proterra Resit -pintakäsittely taas on nopea ja helppo käyttää. Kantare Vivace C näyttää ja tuntuu ”luomukitaralta” sanan parhaassa merkityksessä. Uusi viimeistely tuo myös loimuvaahterakaulan kauneuden esiin. Kaulaprofiili on hieman perinteistä pyöreämpi, ja myös tässä Kantaressa on otelaudan reunassa kaksi otemerkkiä. Vivace C:n ääni on luomuteemaan sopivasti kuiva ja orgaaninen. Tässä kuuluu selvästi puun sointi. Bassot eivät kumise, keskialue on lämmin ja diskantti avoin, muttei terävä. LaMancha on suhteellisen tuore brändi Saksasta. LaManchan soittimet suunnittellaan Saksassa, ja ne valmistetaan firman omassa tehtaassa Kiinassa. 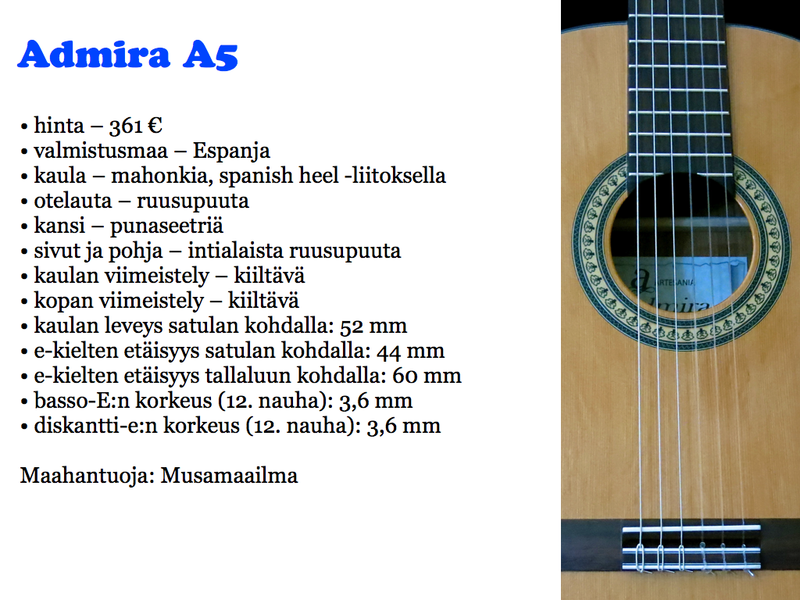 LaMancha on nykyään Saksassa eniten myyvä klassisten kitaroiden merkki, ja monet mallit ovat myös voittaneet European Guitar Teachers Association -järjestön palkintoja. LaManchan soittimia tuo maahan Musiikki Silfverberg. Saimme testisoittimen lainaksi Vantaan Musiikilta. LaMancha Rubi CM SN on mattaviimeistelty kitara kapealla kaulalla, mikä tekee soittamisesta helpomman esimerkiksi lapsille. Rubi CM SN on kolmas kitara tässä katsauksessa, jolla on spanish heel -kaulaliitos. Kaulapuuksi on valittu toona-niminen puulaji, joka on seetrin sukulainen. Toonaa kasvaa esimerkiksi Aasiassa ja Australiassa. Kaulan lujuutta lisäävät kaksi grafiittitankoa, joita on upotettu kaulaan ruusupuisen otelaudan alle. LaManchan työnjälki on hyvin siisti. Rubi CM SN on hyvin tyylikäs ja erittäin kevyt kitara. Rubin kaulaprofiili on paitsi kapeampi myös hieman pyöreämpi kuin perinteisessä klassisessa kitarassa. Otelaudan reunaan on upotettu pienet otemerkit viidennen ja seitsemännen nauhan kohdalla. Rubi CM SN -mallin ääni on mukavan tasapainoinen ja hieman kuiva. Bassorekisteri on jäntevä. Tässä kitarassa soi puu. Japanilainen Takamine on tunnettu etenkin mikitetyistä teräskielisistä kitaroista, mutta firmalla on myös klassisia kitaroita valikoimassaan. Takaminen soittimia tuo maahan EM Nordic. Saimme testisoittimen lainaksi DLX Musiikilta. 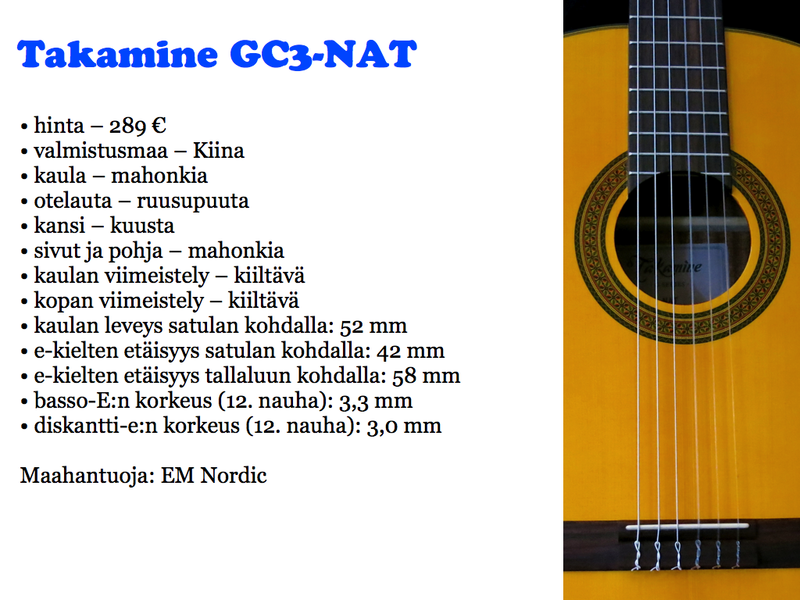 Takamine GC3-NAT on Kiinassa valmistettu klassinen kitara kuusikannella. Kannen kellertävä värisävy muistuttaa šellakalla viimeistellyn kitaran ulkonäköä. GC3-NAT:n pelkistetty ruusupuinen talla on raikas kontrasti soittimen runsaasti koristeltuun rosettiin. Takamine varmistaa myös klassisten kaulojensa lujuutta asentamalla niihin kaularaudan. GC3-NAT-mallin kaulaprofiili on hyvin perinteinen – leveä, laakea ja aavistuksen verran kulmikas. Kielten korkeus oli säädetty mukavan matalaksi, mikä teki soittotuntumasta vaivattoman. Tämä Takamine tarvitsi hieman sisäänsoittoa, ennen kun ääni aukesi kunnolla. Toimenpide kuitenkin kannatti ehdottomasti, koska GC3-NAT:n ääni on kauniisti laulava ja avoin, sekä napakalla atakilla höystetty. Valencia oli ainakin minulle uusi tuttavuus, vaikka firma on perustettu jo vuonna 1972. Valencia-kitarat sunnittellaan Australiassa, ja ne valmistetaan useissa eri tehtaissa Kiinassa ja Indonesiassa. Valencian soittimia tuo maahan EM Nordic. Saimme testisoittimen lainaksi DLX Musiikilta. Kuusikannella varustettu Valencia GC50 on tämän katsauksen runsaimmin koristeltu soitin. Sekä kannen että pohjan reunat on koristeltu monikerroksisella reunalistoituksella, jossa uloin kerros on mahonkia. Pohjan keskisaumassakin on kaunis mahonkikoristus. GC50:n kaula on tehty kolmesta pitkästä vierekkäisestä palasta. Keskimmäinen pala on käännetty pituussuunnassa 180 astetta, mikä minimoi kaulan vääntymisen riskin. Valencian kaulaprofiili perustuu perinnekaulaan, mutta siihen on lisätty aavistuksen verran pyöreyttä. Testisoittimen kielten korkeus on jo hieman korkea omaan makuuni (en ole Andrés Segovia). Soitinrakentaja (tai kokenut soittaja itse) voisi madaltaa GC50:n tallaa varmasti ongelmitta vielä noin millimetrin verran, mikä tekisi tatsista selvästi pehmeämmän. Valencia GC50:n soundi on hyvin avoin ja lyyrinen. Ylänauhoillakin soitetuissa äänissä on kaunis, laulava klangi. 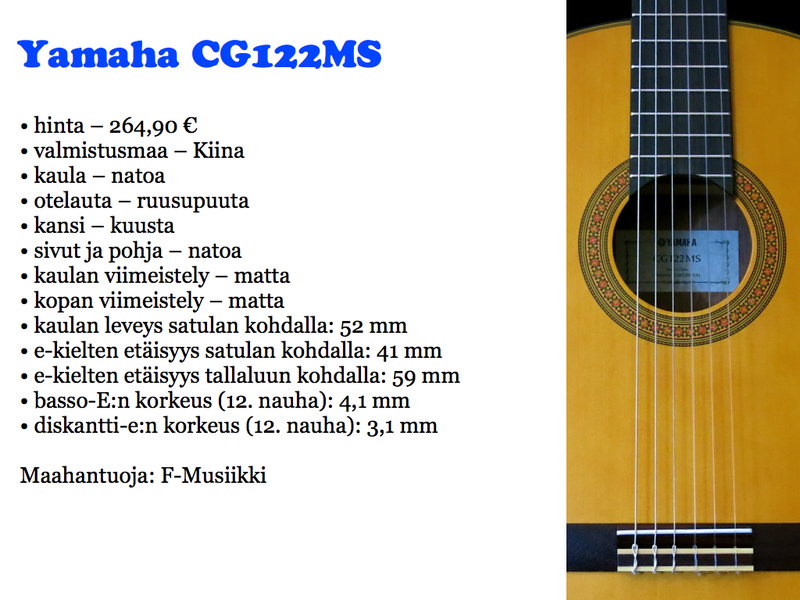 Klassiset kitarat ovat aina olleet hyvin tärkeä osa Yamaha Guitarsin mallistossa, ja firman C40-malli on yhä eniten myyty klassinen kitara maailmassa. Uusi Concert-sarja on luonnollinen jatkumo Yamahan tuotekehitykselle. Yamaha CG122MS on Concert-sarjan mattaviimeistelty edullinen jäsen. CG122MS:n viimeistely on hyvin ohut, minkä ansiosta kosketuksessa tuntuu selvästi puun pintarakenne. CG122MS on kevyt soitin hieman perinnekaulaa pyöreämmällä kaulaprofiililla. Nauhojen etsinnässä auttavat otemerkit otelaudan reunassa (5. ja 7. nauhan kohdalla). CG122MS:n soitettavuus on hyvin mukava perinteisellä tatsilla. Tämän Yamahan äänessä on mukana aimo annos puun klangia. Sointi on kaunis ja tasapainoinen, selkeällä atakilla höystettynä. Tämän katsauksen ainoana kitarana Yamaha CG142S tarjoaa mattaviimeistellyn kaulan yhdistettynä kiiltäväksi lakattuun koppaan. CG142S edustaa hillittyä tyylikkyyttä. Työnjälki on erittäin siisti. Tämän Yamahan kaulaprofiili tuntuu aavistuksen verran ohuemmalta kuin yleisesti klassisissa kitaroissa. Mallin soitettavuus on hyvin mukava. Myös CG142S-kitarassa on otelaudan reunassa kaksi otemerkkiä. Yamaha CG142S soi pyöreästi, mutta silti selkeästi. Soundin keskialue on kauniin siisti ja kitara artikuloi tarkasti. Yhteenvetona voisin todeta, että hintahaarukassa 250-400 euroa on tarjolla runsaasti hyvin rakennettuja ja hyvin soivia klassisia kitaroita. Soittaja voi niistä valita itselleen sopivimman vaihtoehdon käyttötarkoituksen, ulkonäön ja soundin perusteella. Julian Bream and John Williams – need I say more? Julian Bream and John Williams play a piece by Fernando Sor.